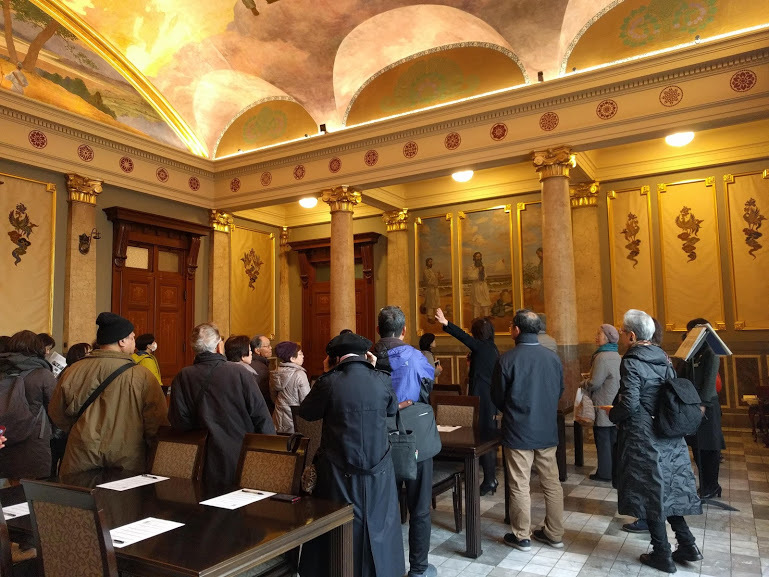 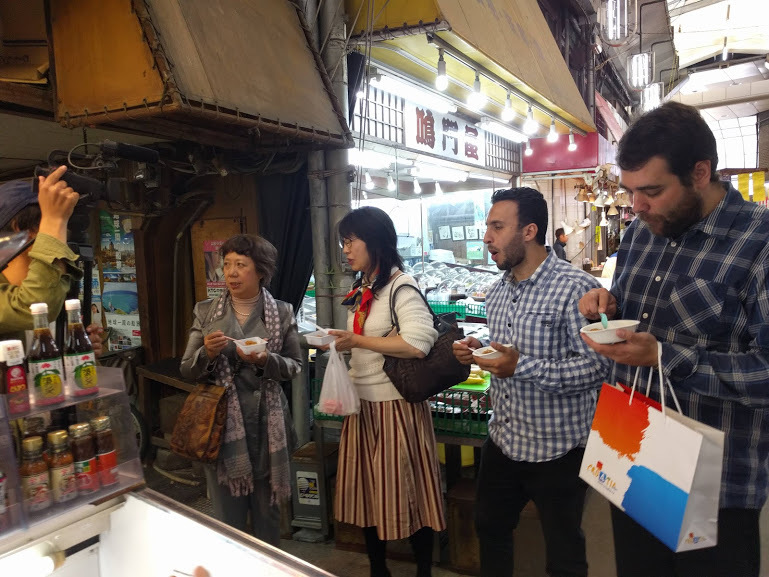 8 guest ( include 4 frequent customer ) joined this tour.Osaka city central hall is known for its long history and gorgeous interior.Guide tour is so popular among Japanese.We booked this tour in advance.Guest enjoyed business lunch,unique spot visiting in Umeda area,Dotonbori walk and Takoyaki tasting! 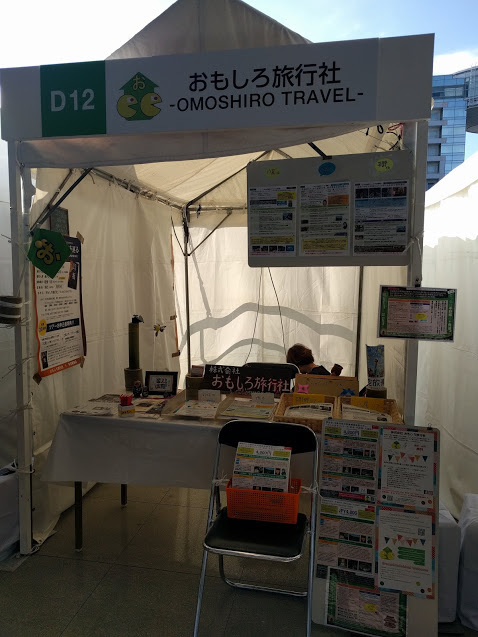 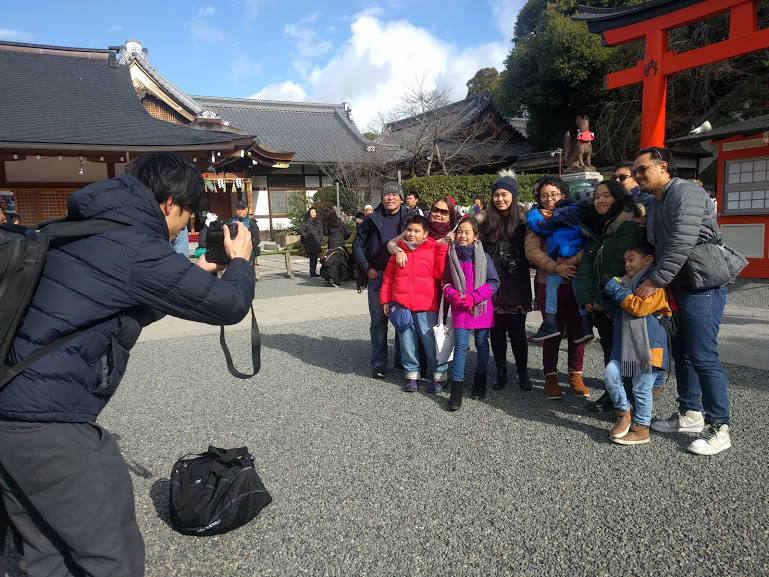 English speaking guide of Omoshiro Travel attended for 12 people from Philippine.They are all family or relative.It was cold day and snowing in Kyoto.Guest were so excited as they saw snow first time!We visited Fushimi Inari Shrine,Kiyomizu temple,Nishiki food market so on.They are very nice family. 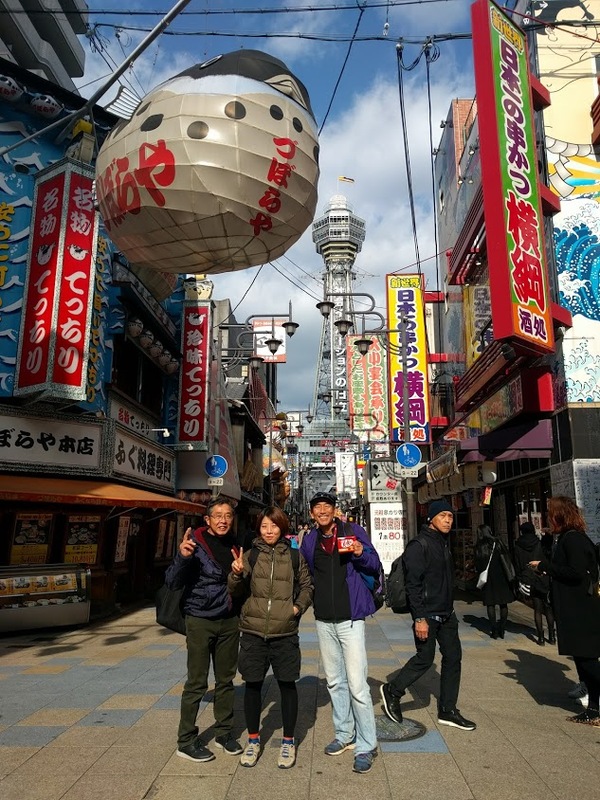 3 individual participants joined in Hirano tour.One is from far Tokushima pref! 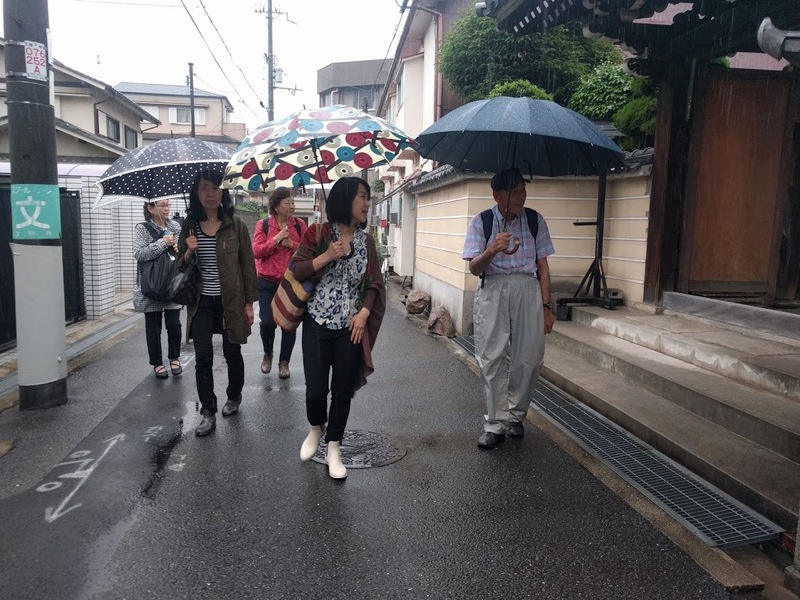 They enjoyed walking in historical area,eating and chatting with local as usual! 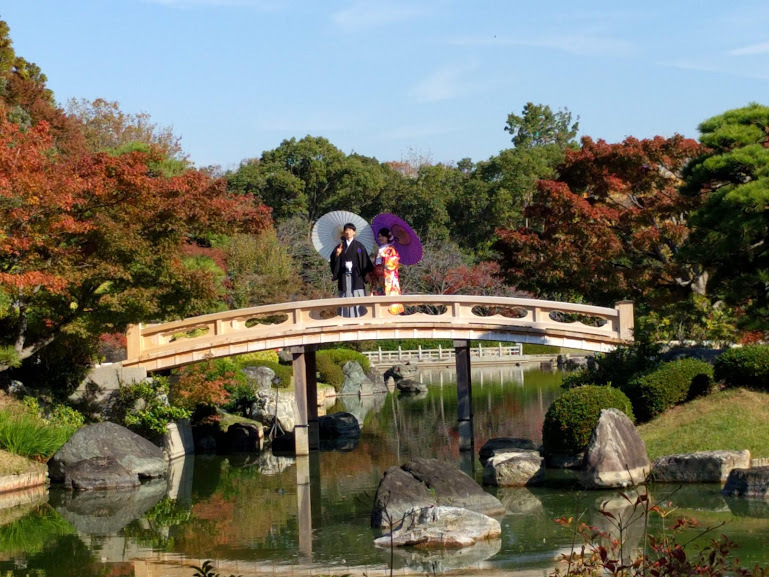 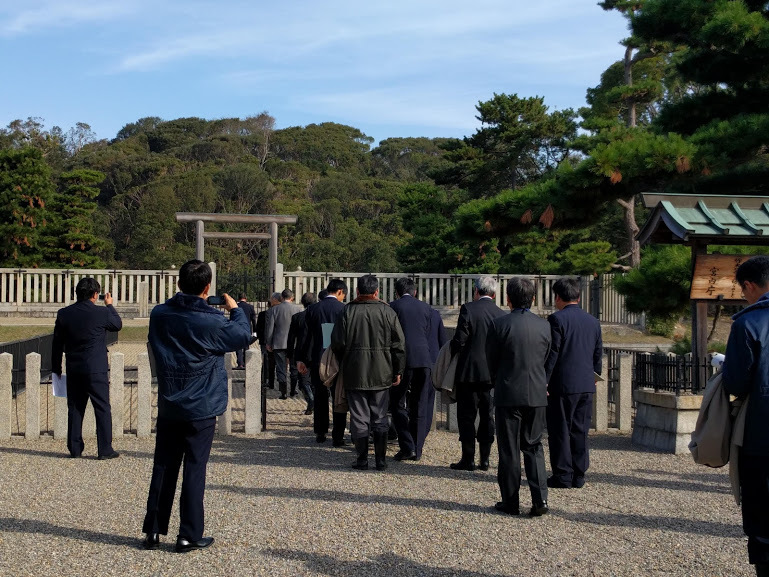 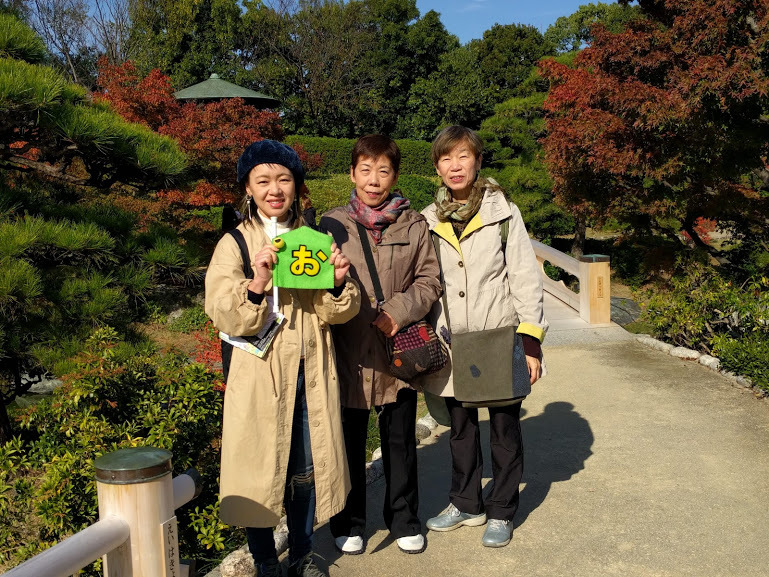 3 individual guest enjoyed our Sakai tour.They met some couples who took pre-wedding photo in autumn colored japanese garden.At Kofun( ancient large tomb ),guests saw unusual situation.The front gate has opened! 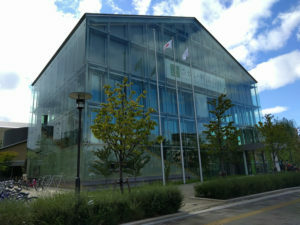 ( Normally it always closed ).The special investigation was held on the day by chance. 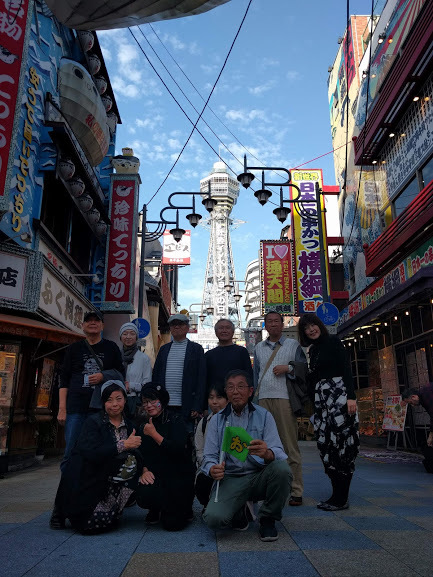 9 guests enjoyed our Deep tour in Osaka.They visited ”The Entrepreneurial Museum of Challenge and Innovation” for study,maid cafe ( cafe staff are wearing cute costume )for fun,Kushikatsu restaurant for eat and drink,Tsutenkaku Tower for view,nostalgic shopping mall for walking and Disaster prevention center for training. 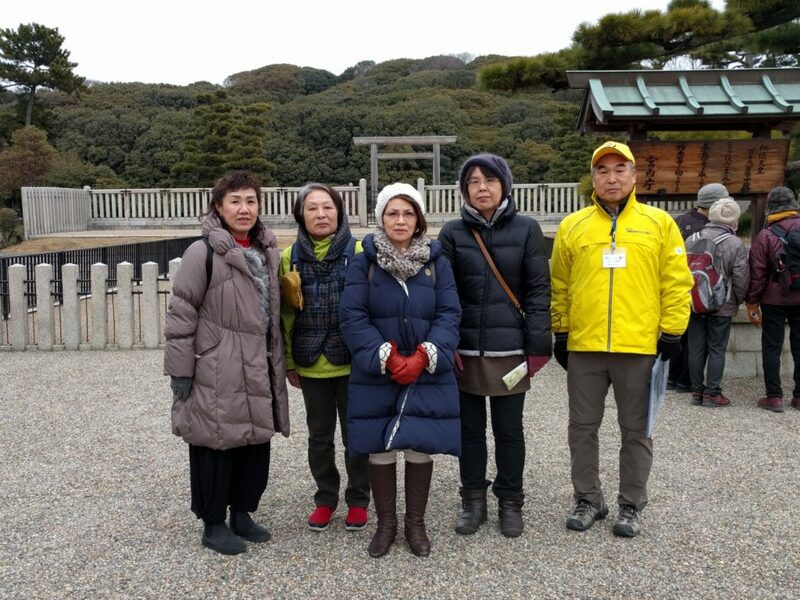 Egyptian,Croatian,Chinese guest so on joined this tour. 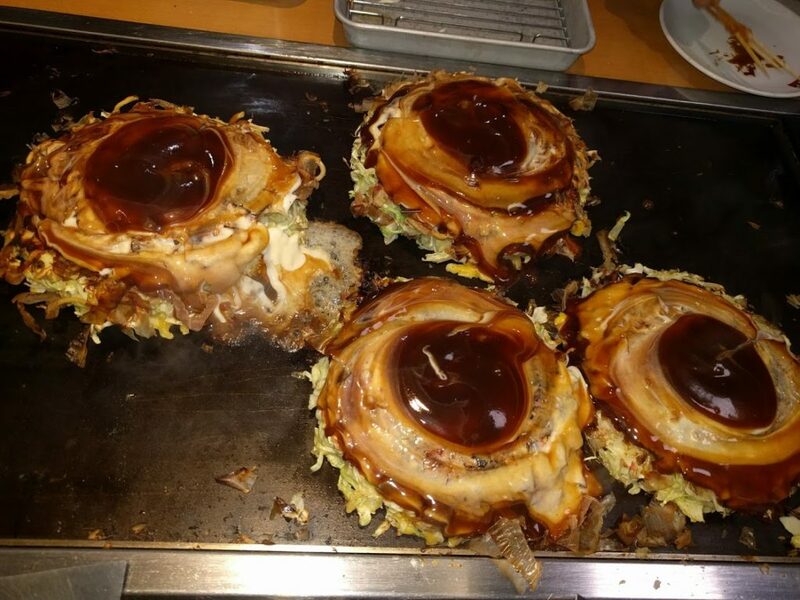 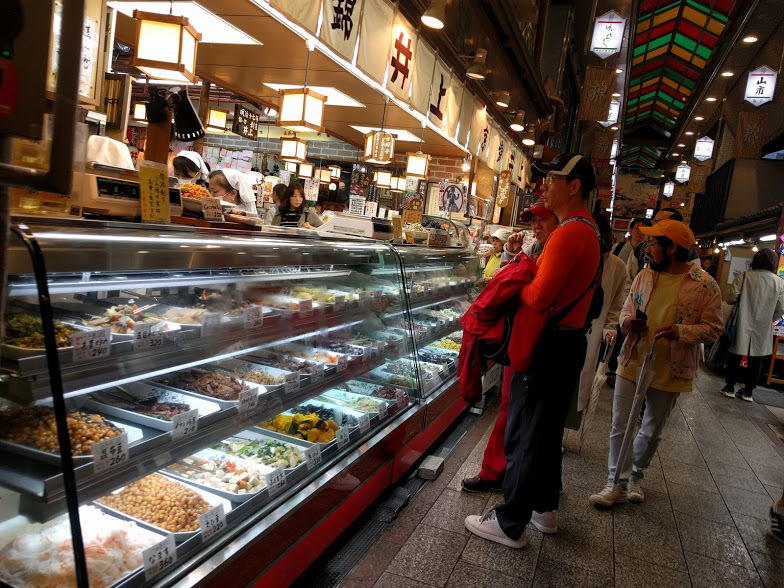 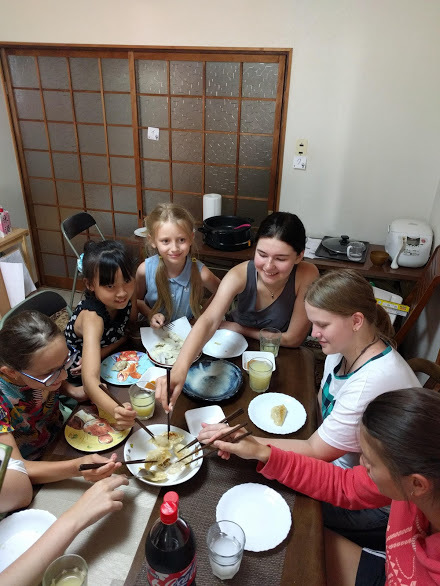 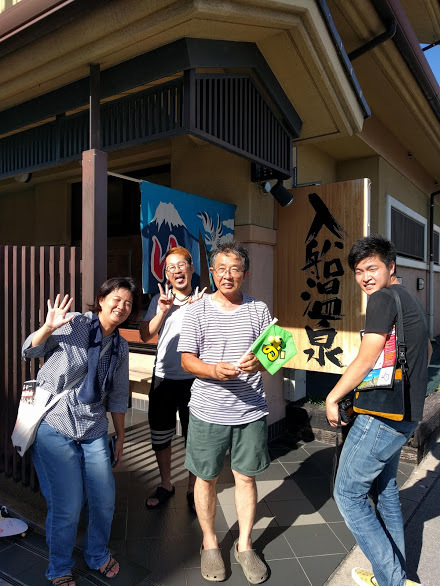 With eating rice made snack,takoyaki,tofu,okonomiyaki etc.They enjoyed local waling! 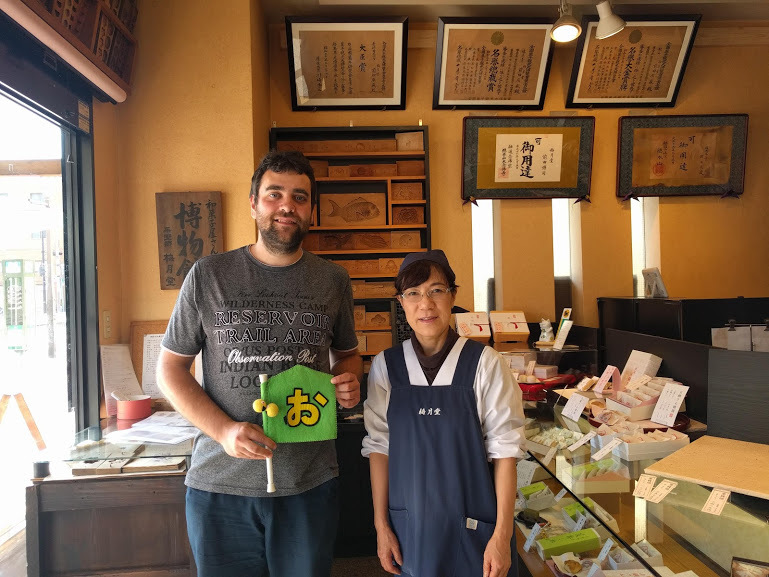 The guest from Rijeka,Croatia visited Japanese sweet museum,old house,hell hall and experienced meditaion in Hirano.Then visited Osaka Castle in the afternoon. 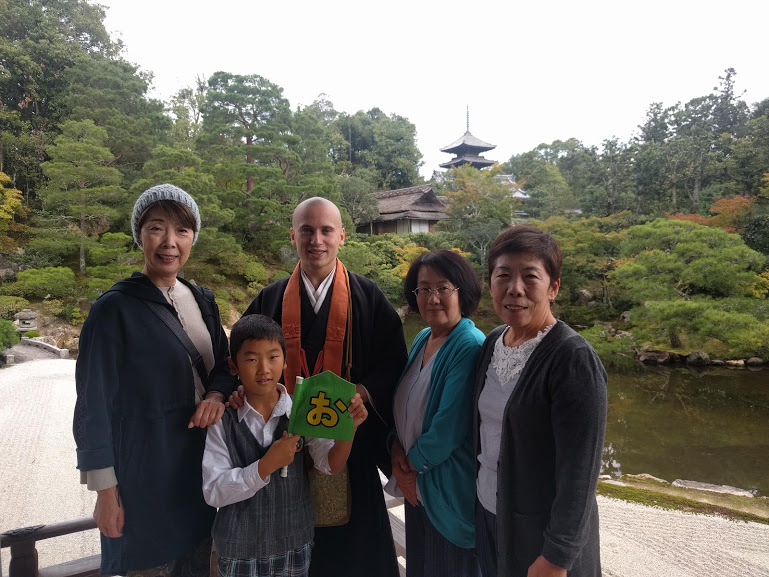 The monk who is from Vladivostok,Russia guided 4 guest ( including 9 year old boy ) into Kyoto on sunny day. 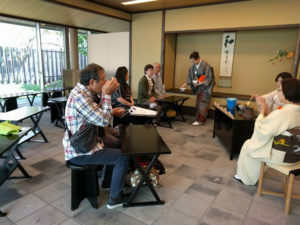 He had trained at Ninnaji Temple( Unesco ) for 1 years as first monk from foreign country.That is why his explanation or talk which based on REAL story attracted guest so much! 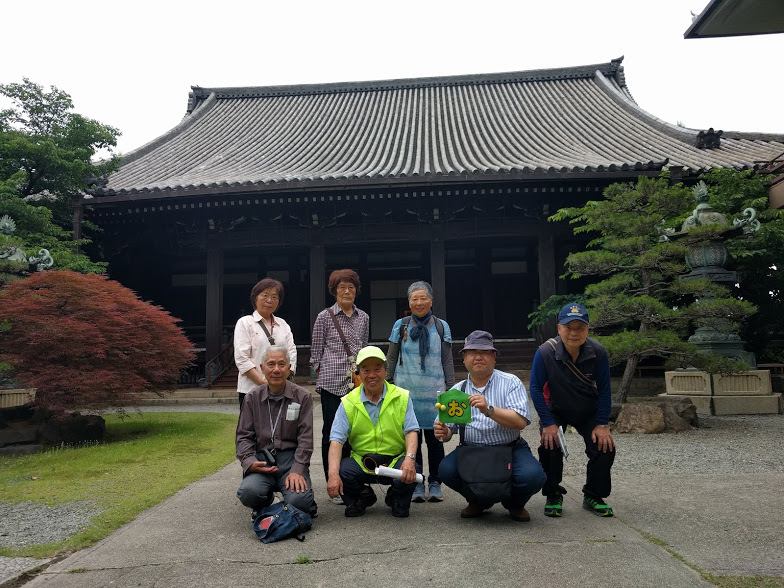 5 guest joined our NARA tour.They visited Todaiji to see Giant Budha and deer in Nara Park.Local guide explained history or detail of each sightseeing spots which gave much better quality to our tour!Old historical city walking after lunch was also interesting.There are still much to see in Nara,old capital of Japan. 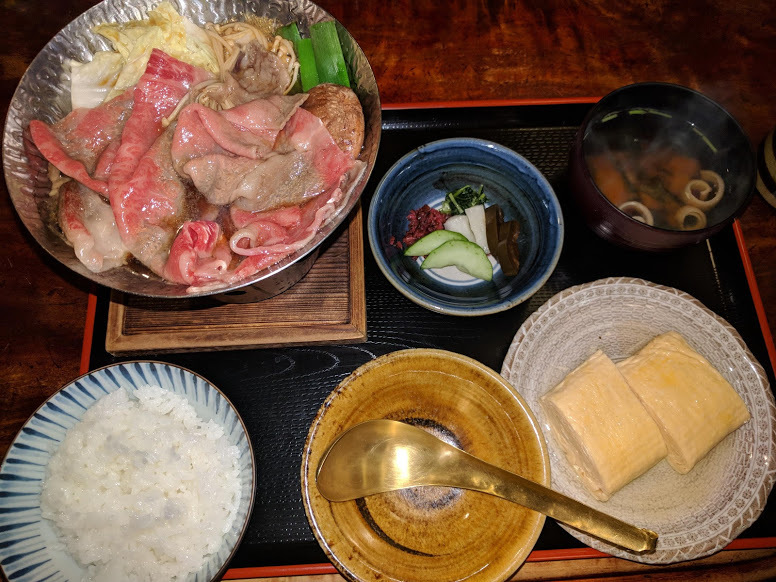 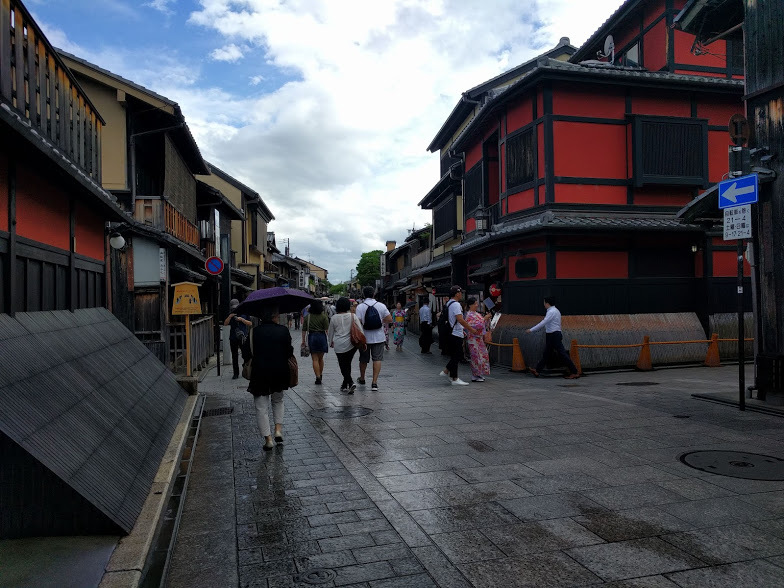 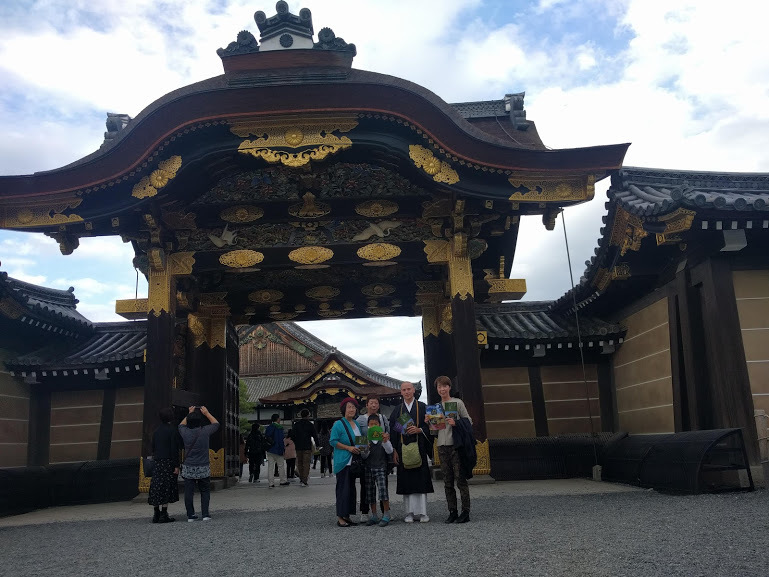 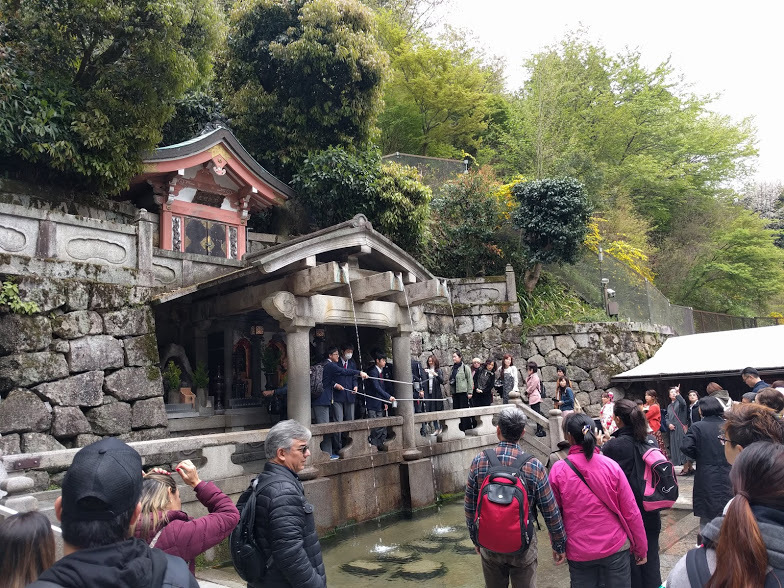 2 Ladies from overseas was guided by our staff.They visited Kiyomizu Temple,Fushimi Inari Shrine and Gion Area.They also had SUKIYAKI lunch and Green tea sweets( Maccha ).They enjoyed Kyoto Day Trip from Osaka very much! 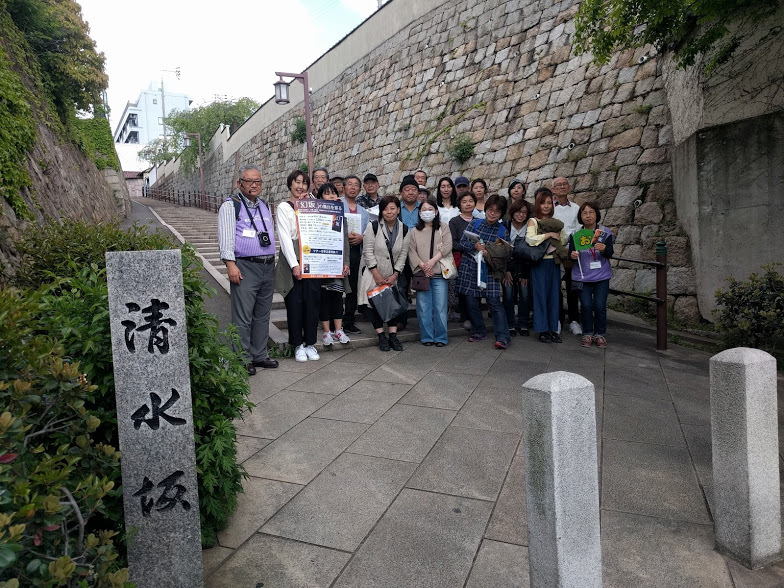 14 Member + 1 Interpreter from Hwaseong,Korea visited Hirano old town.They study township. 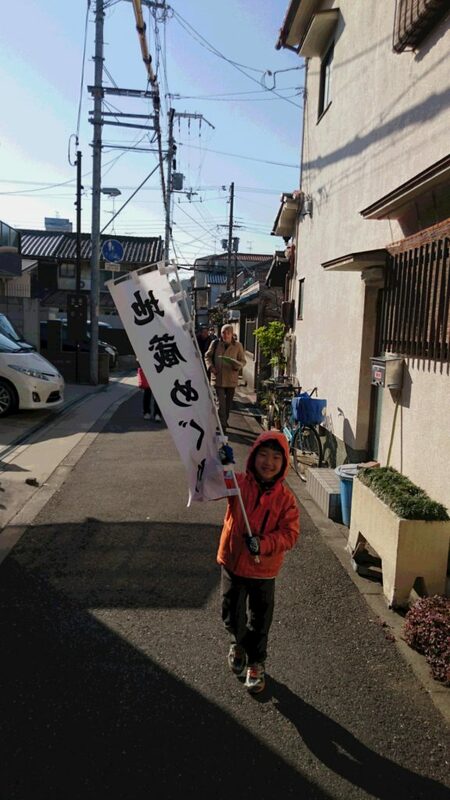 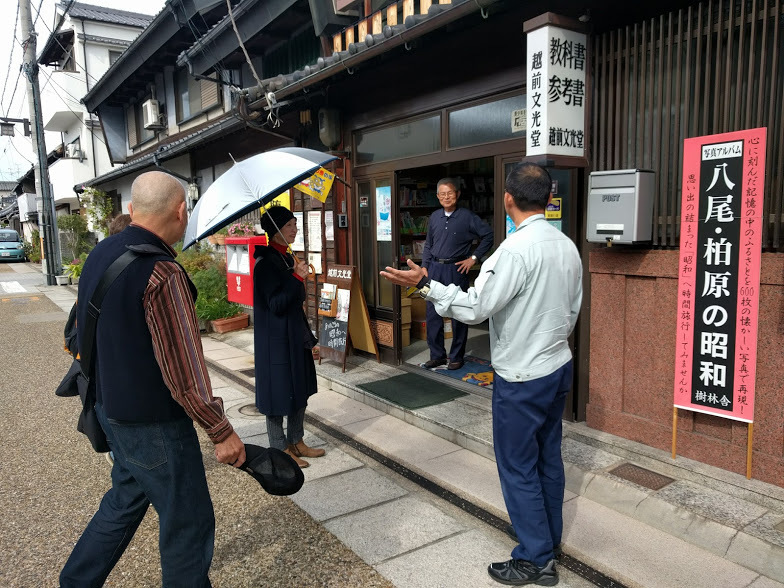 This time they choose Hirano for research as they had interest how Hirano organize its unique town in spite of NO Chaieman,NO Regulations,NO Membership in Hirano Town Ship Group. 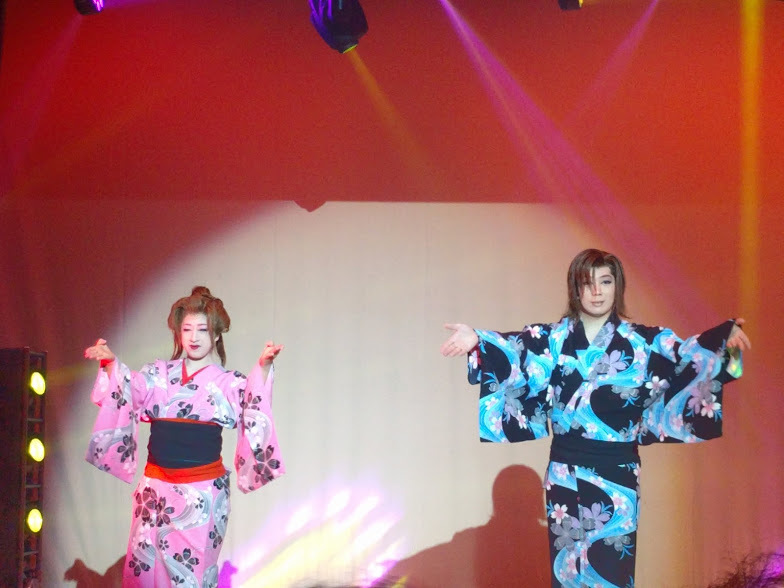 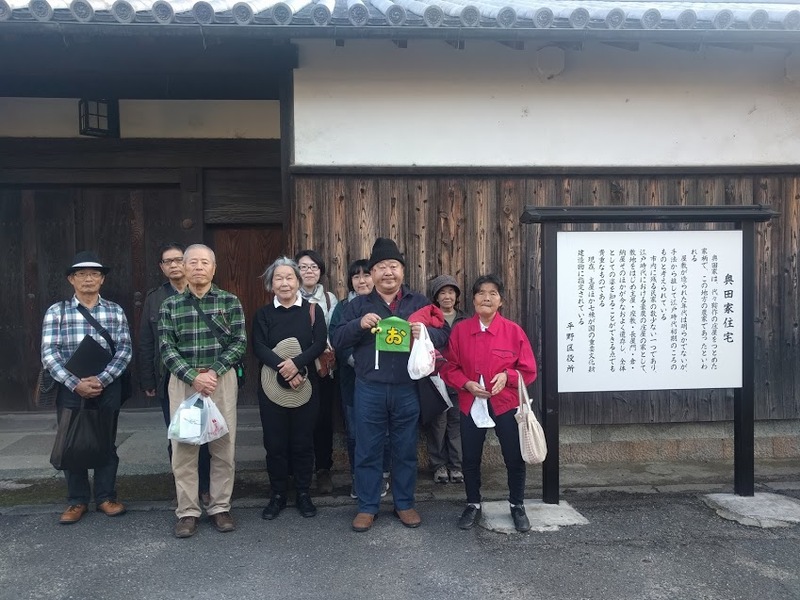 They had good time in Hirano with meeting,playing,eating,visiting small town museums. 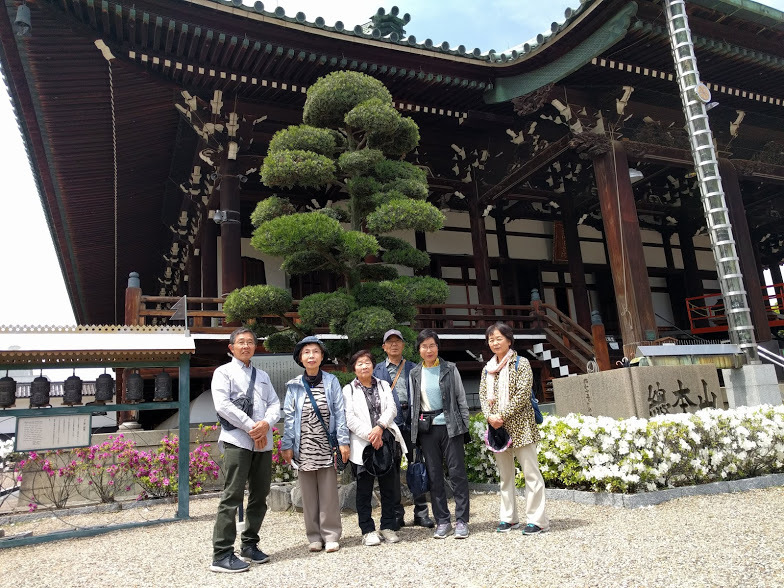 14 guests( consists of 5 family ) joined this order-made private tour. 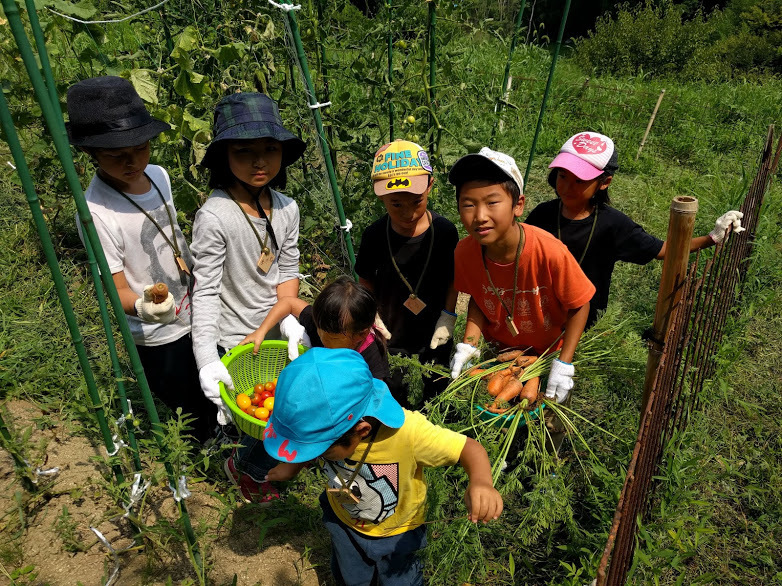 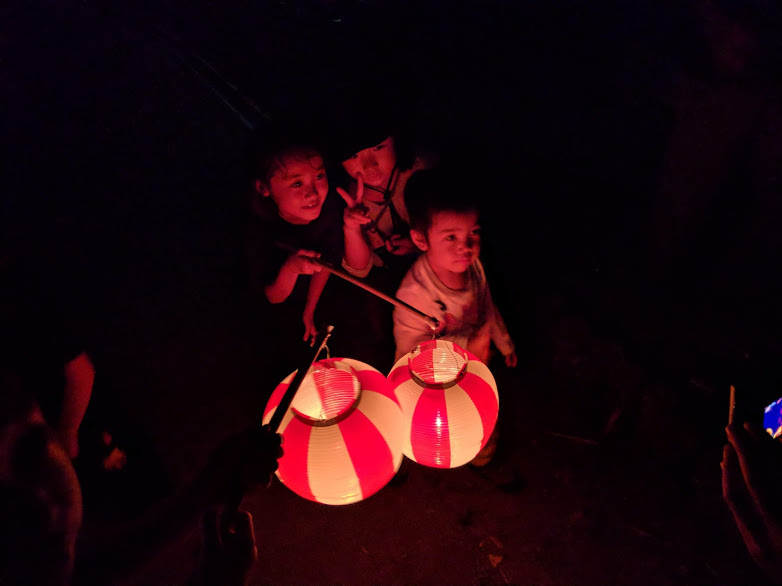 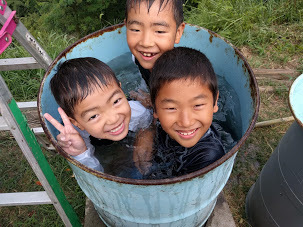 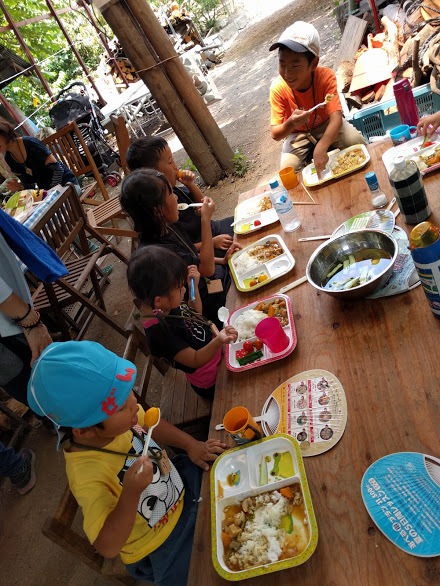 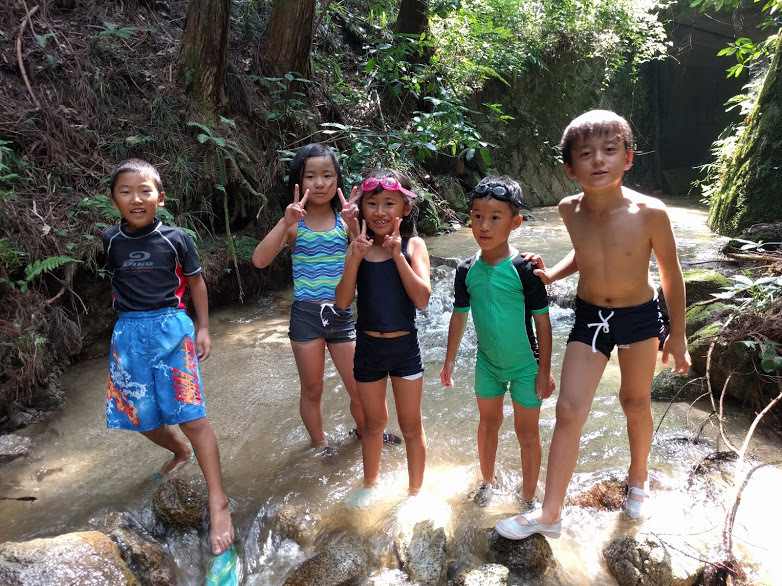 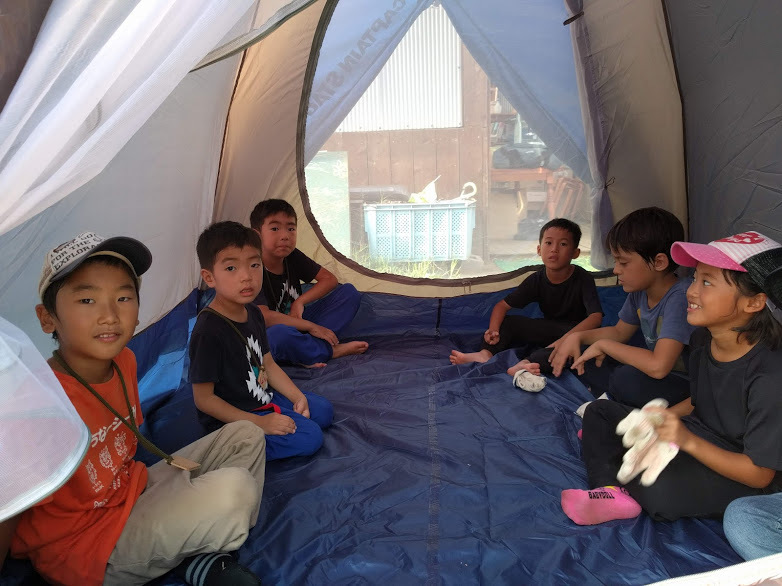 They picked vegetable from garden,play in small river,walk with lantern at night,sleep in tent so on in Satoyama( country mountain ).However there were no air condition ,TV,electric games kids and parents really enjoyed in nature! 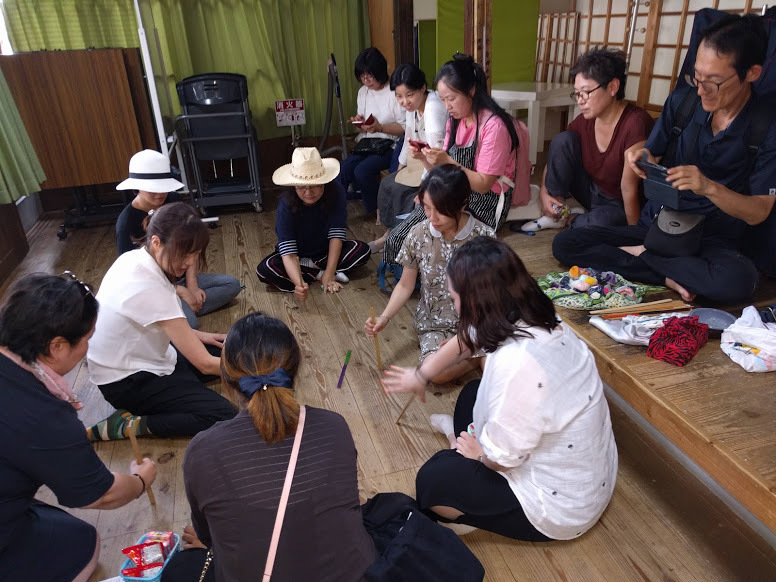 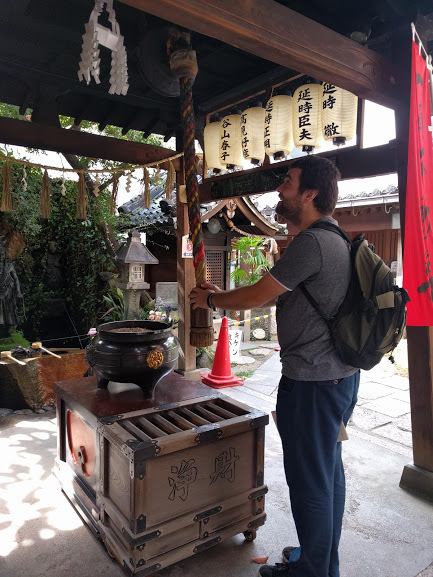 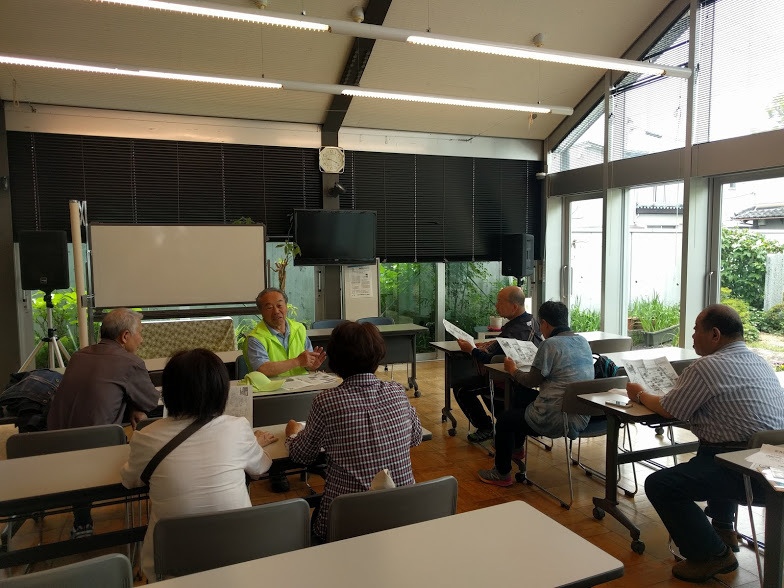 This tour was collaboration with local based Hot spring”Irifune Onsen”.2 guest joined our collabo program which is 3 hours walk in Hirano+Hot Spring at Irifune Onsen.It was too hot day( 38°C!) 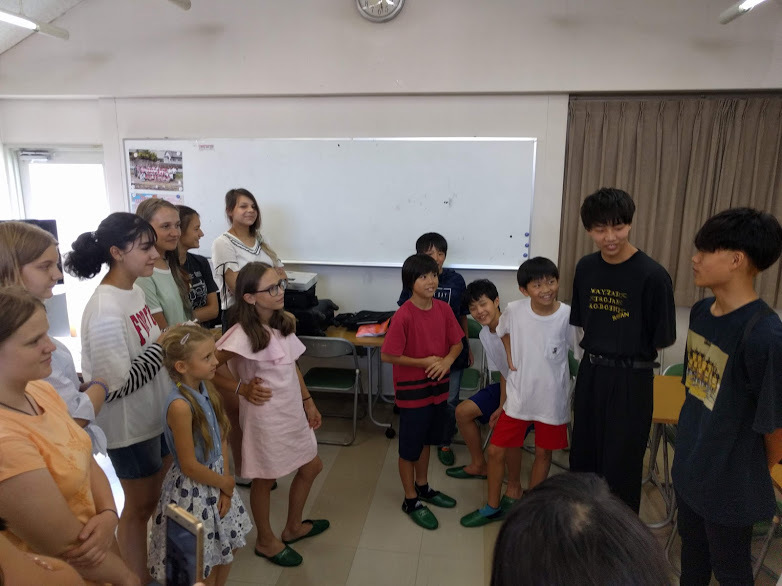 but they enjoyed tour with smile! 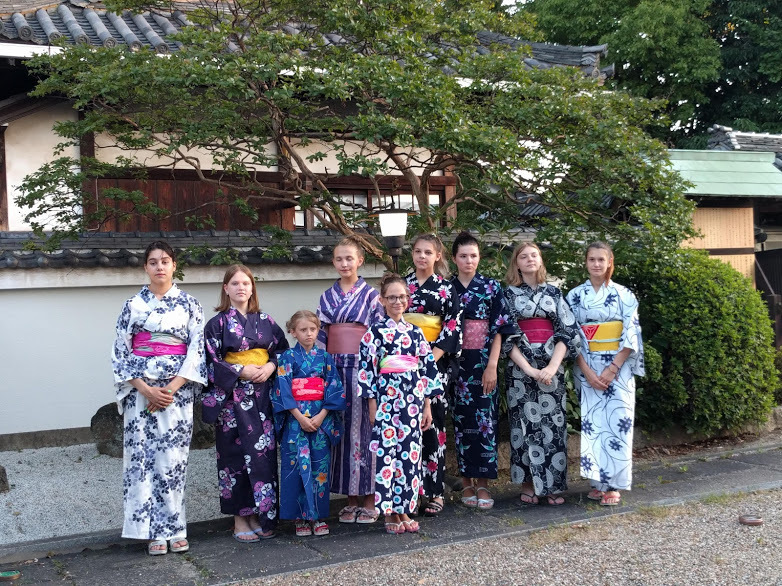 9 girls( age 8-15 )+1 teacher were involved culture&study program by Noganji Temple in Hirano,Osaka.Omoshiro Travel arranged tour portion( Bus transfer,tour,interview to local people and cultural experienced so on ).We did tour for Sakai city and Kyoto city,cooking,balling game with same generation between Russian students and Japanese students.They enjoyed each other very much even though they didn’t understand each language.It was pretty much interesting work and good experience to arrange those international friendship programs!! 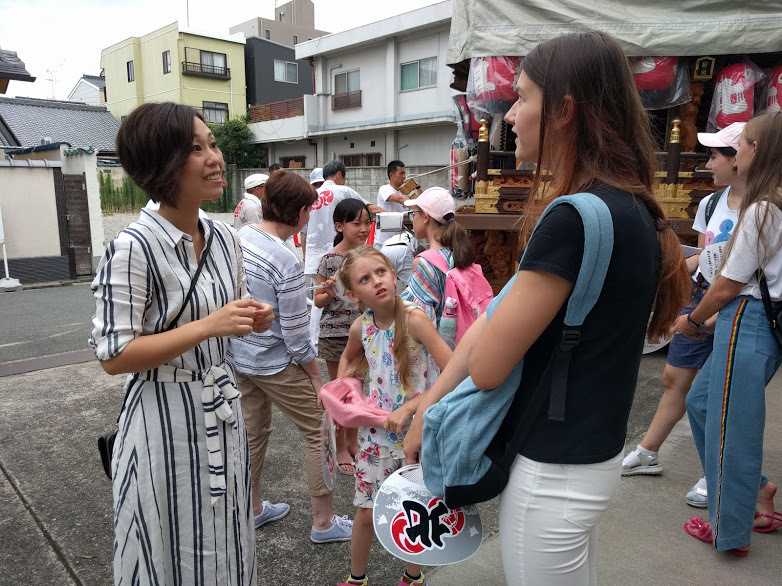 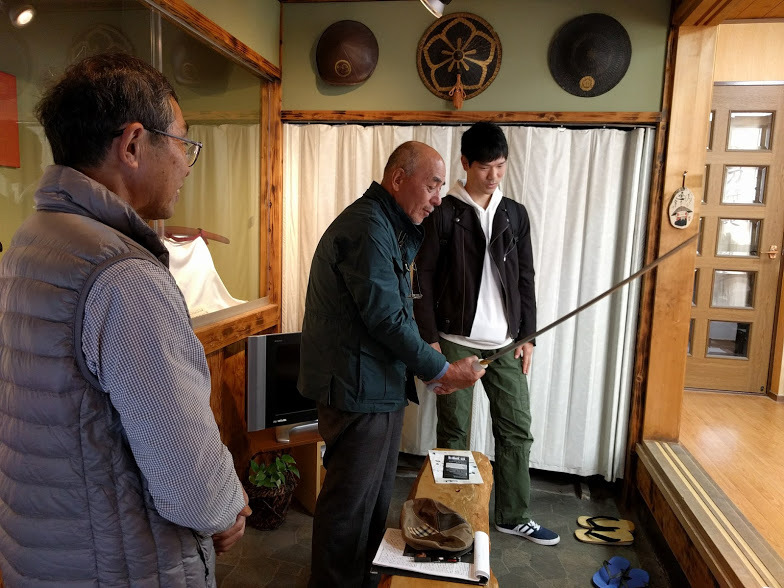 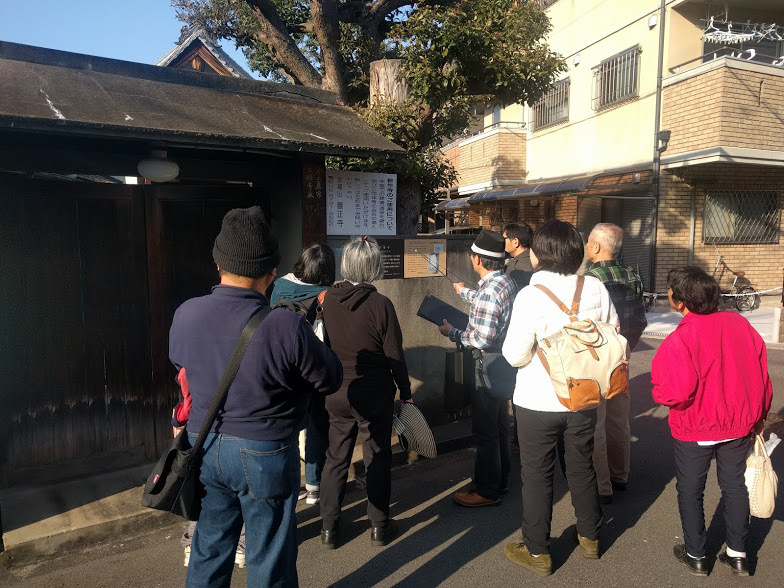 2 individual guest enjoyed our Sakai tour.This time we visited old wooden house which was built 400 years ago!Guest impressed to find so much interesting and local cultures in Sakai. 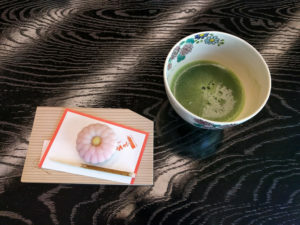 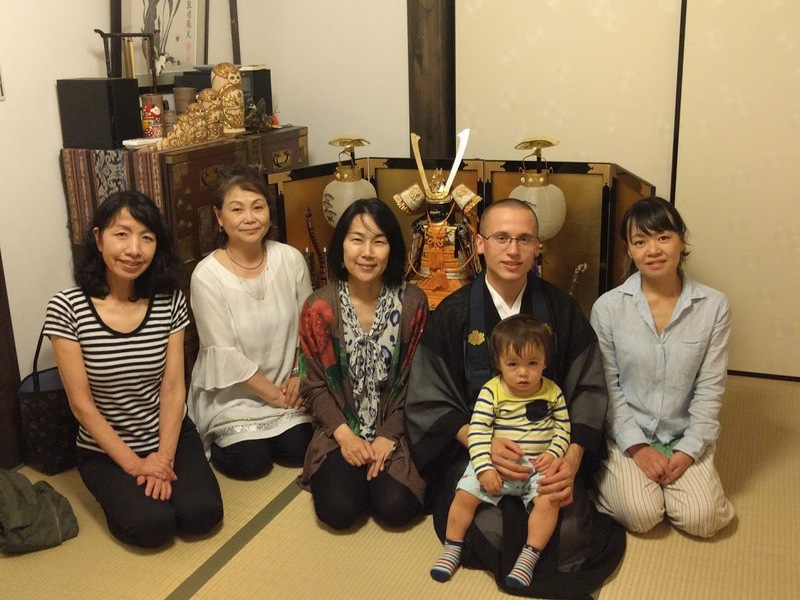 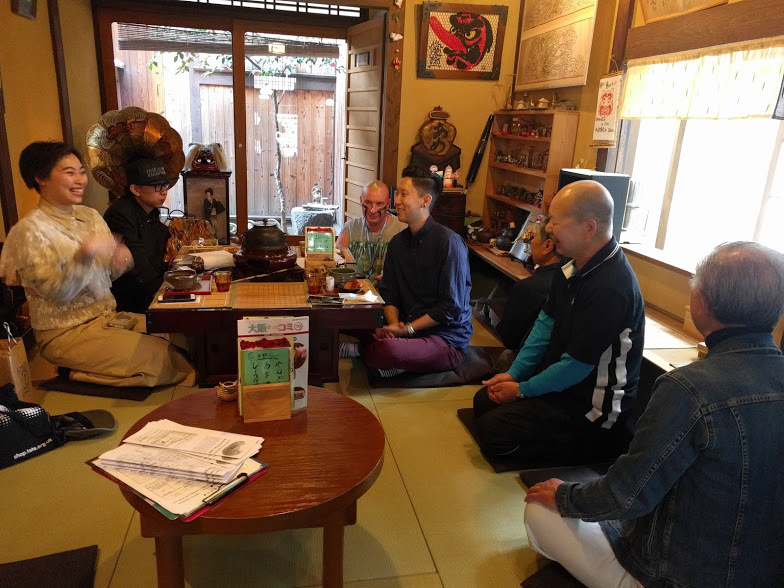 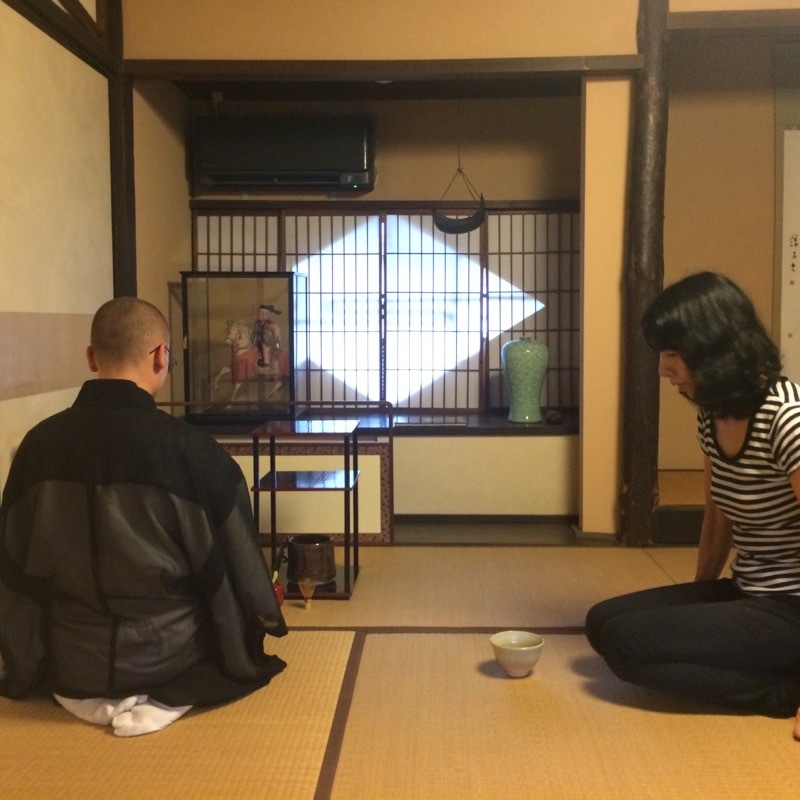 However earthquake happened 2 days ago and it was heavy raining day,3 Guest visited Hirano on 20Jun!They really enjoyed meditation,box lunch,japanese sweets with Maccha ceremony done by Russian monk in buddhist temple. 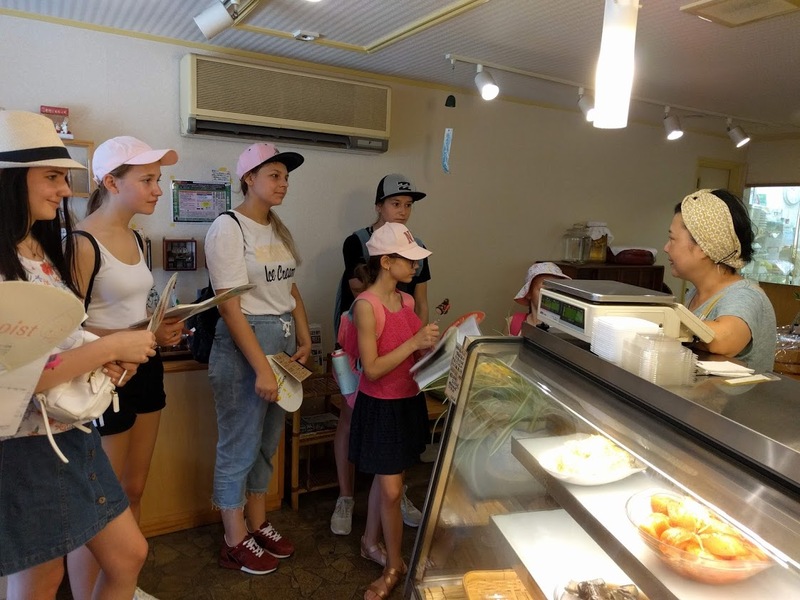 Our staff who has english speaking guide license guided 19 guests( 4 family ) from Malaysia.They are so friendly and nice people whose age are from 7 to 80! 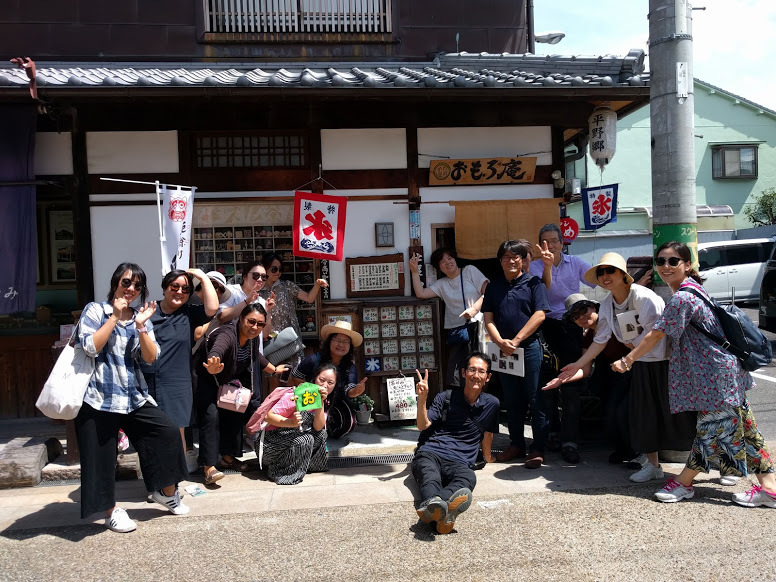 !They enjoyed Kinkaku Temple,Fushimi Inari Shrine,Nishiki Local Market,kimono show so on.They tried round sushi bar for lunch! 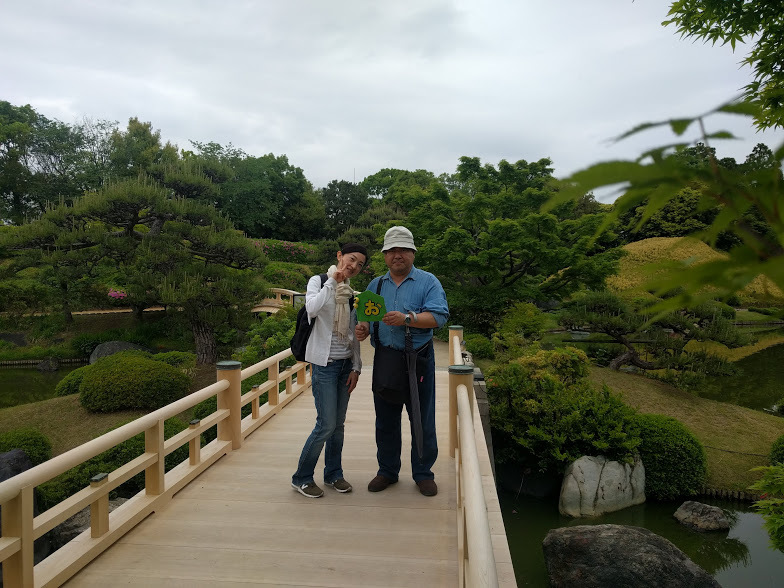 9 Guest visited the best season of Lily Garden in Maishima,Osaka.2.5 Million lily flower were blooming! 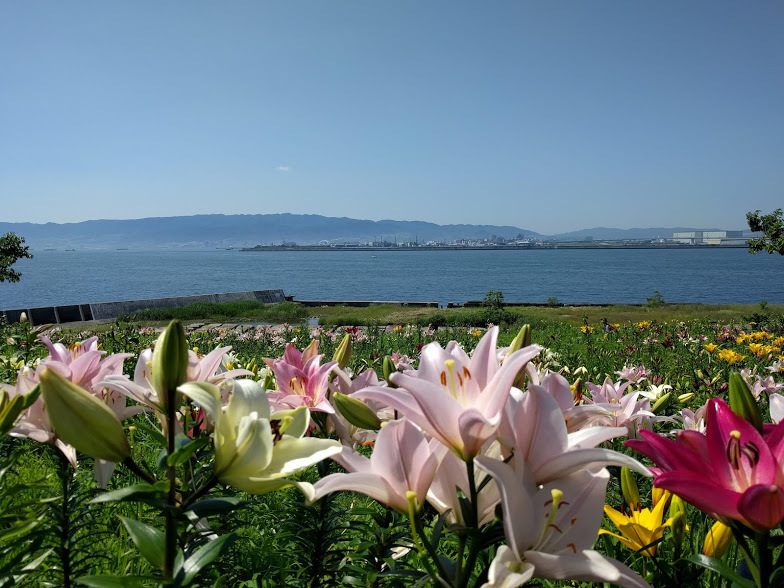 !Location is seaside so the contrast is very beautiful. 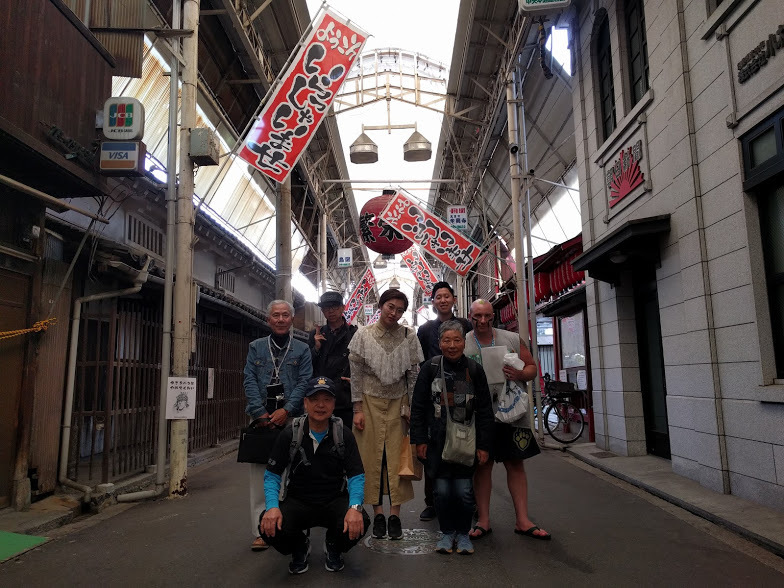 After seafood lunch at Kujo town,local walking tour with experienced guide started!Tour was so interesting thanks of guide’s unique presentation. 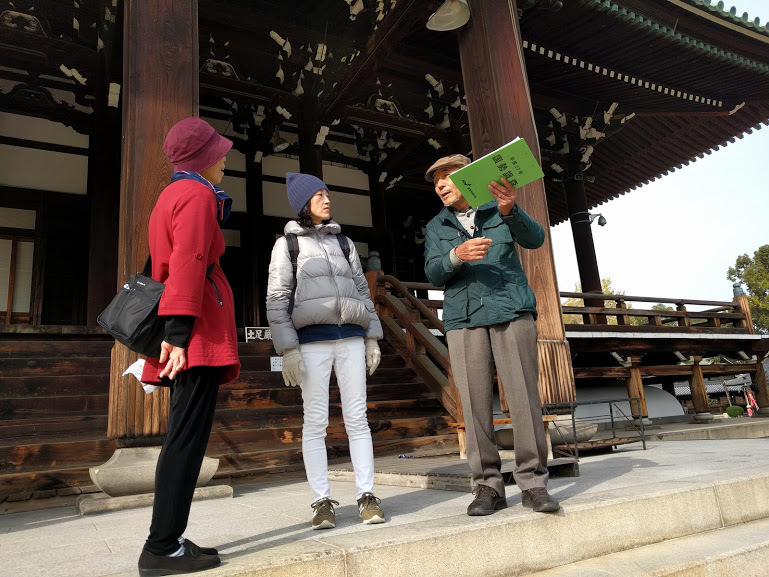 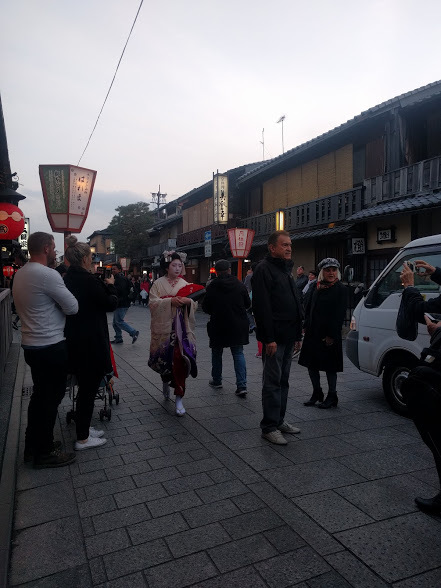 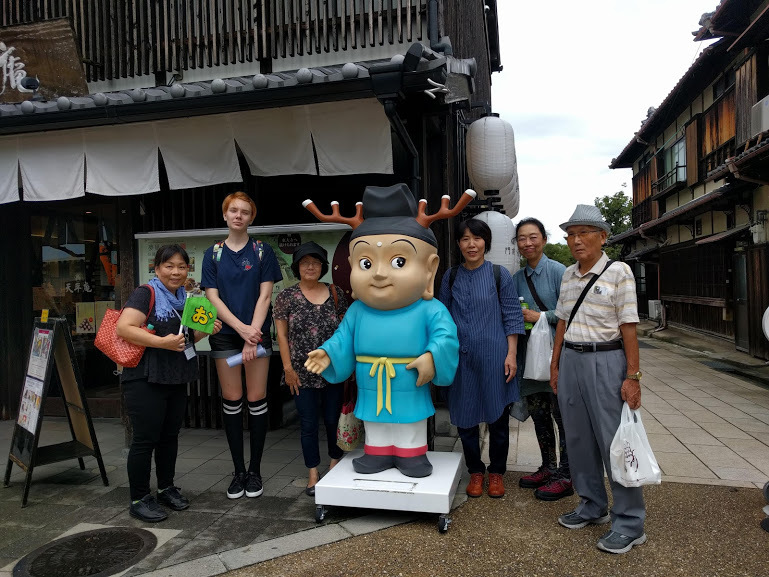 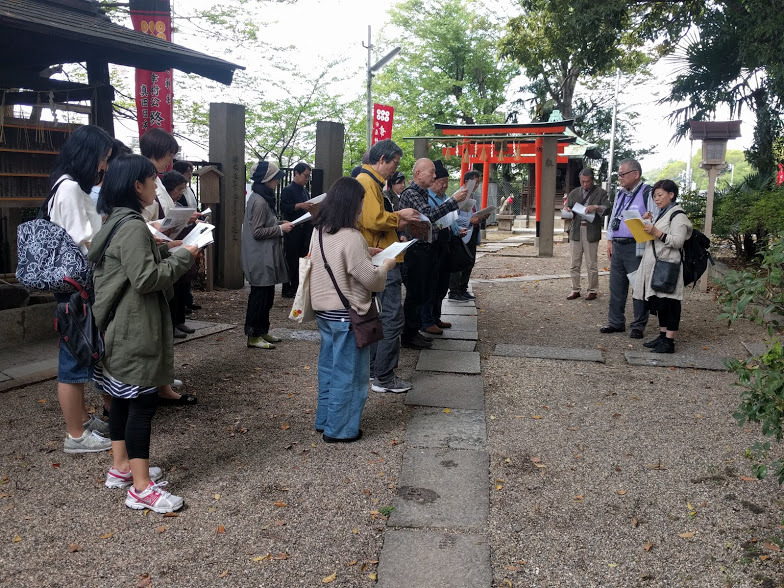 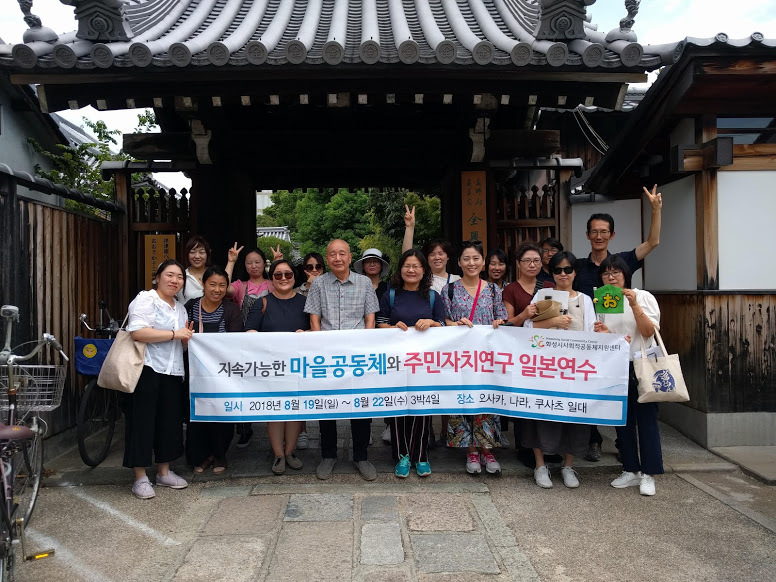 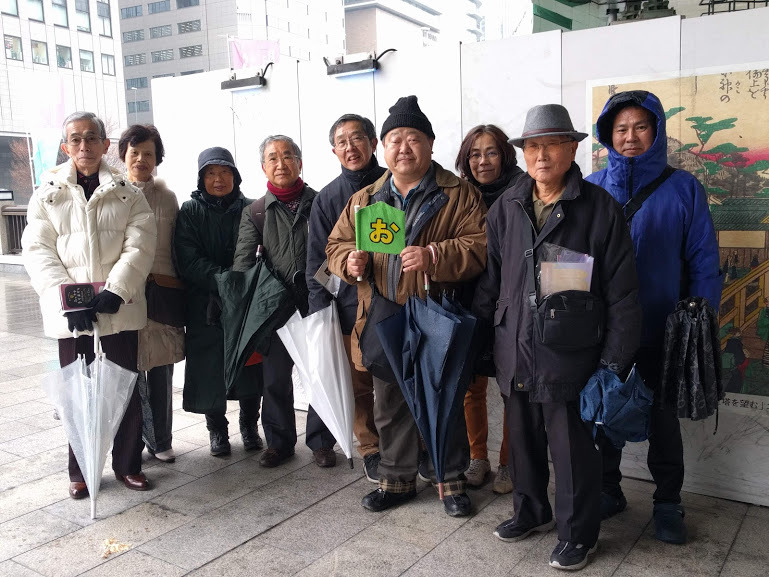 6 Guests joined Yao city Walking tour.Local guide told detail history so on of old town.They enjoyed walking tour in the morning then saw beautiful show & bathing in hot spring. 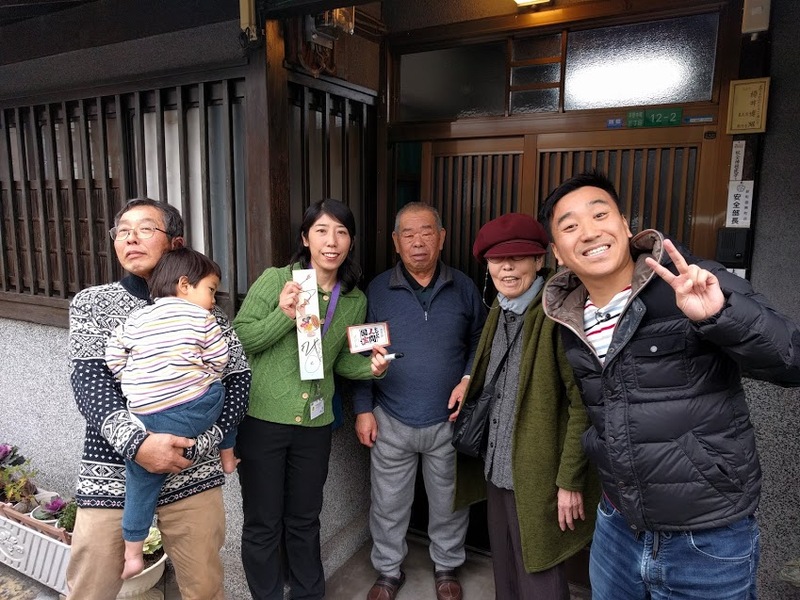 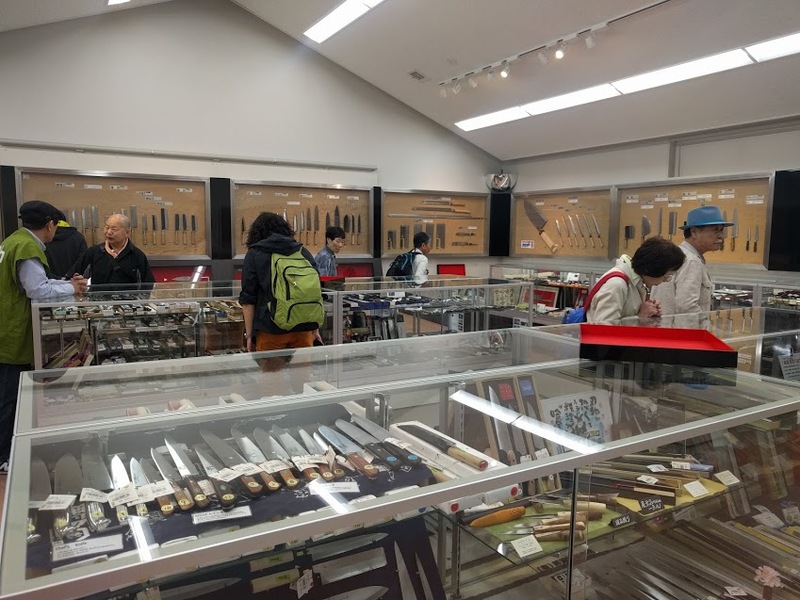 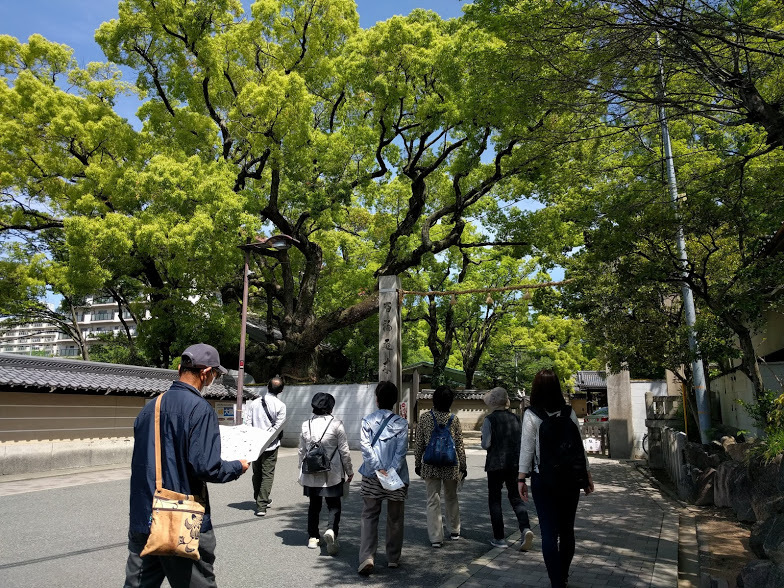 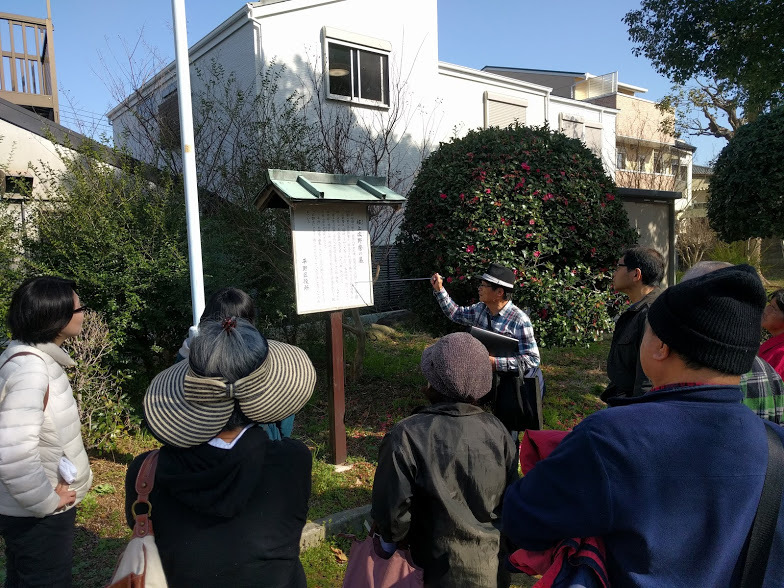 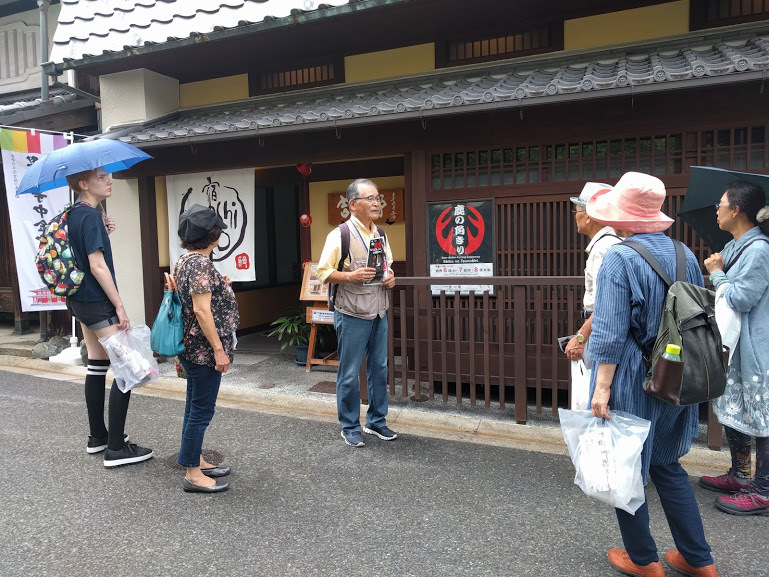 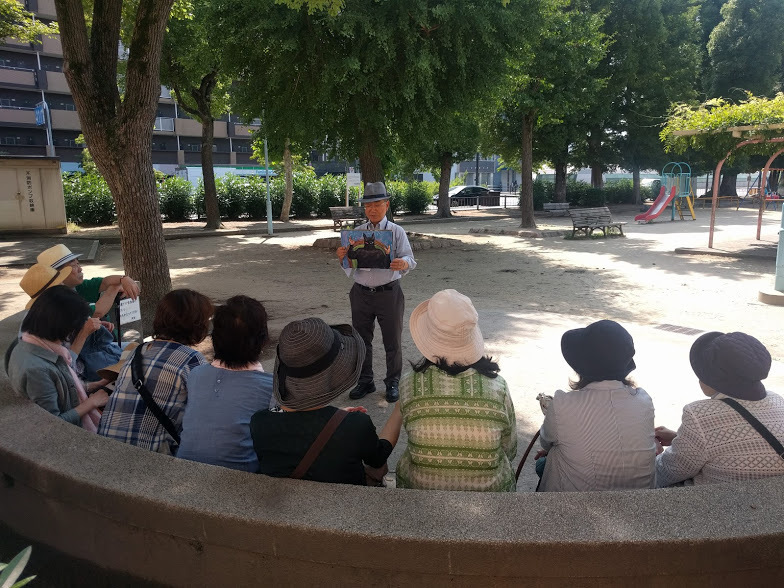 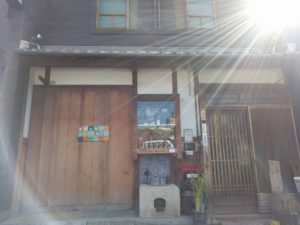 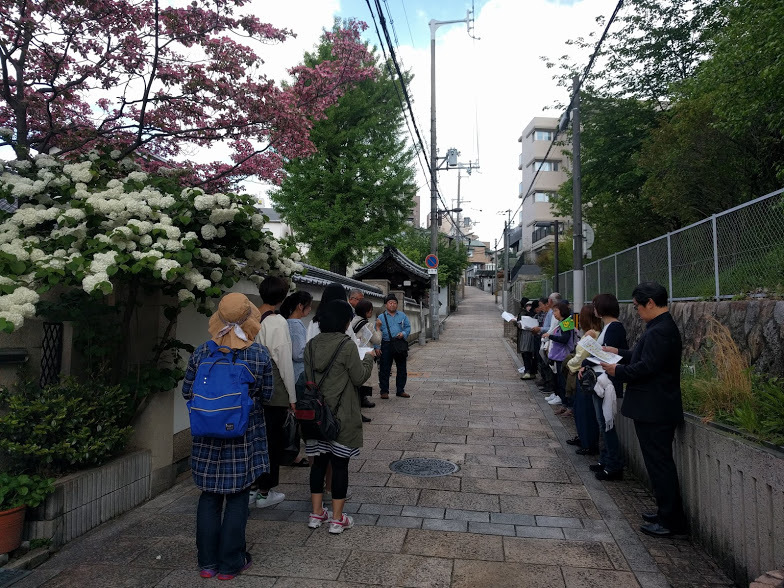 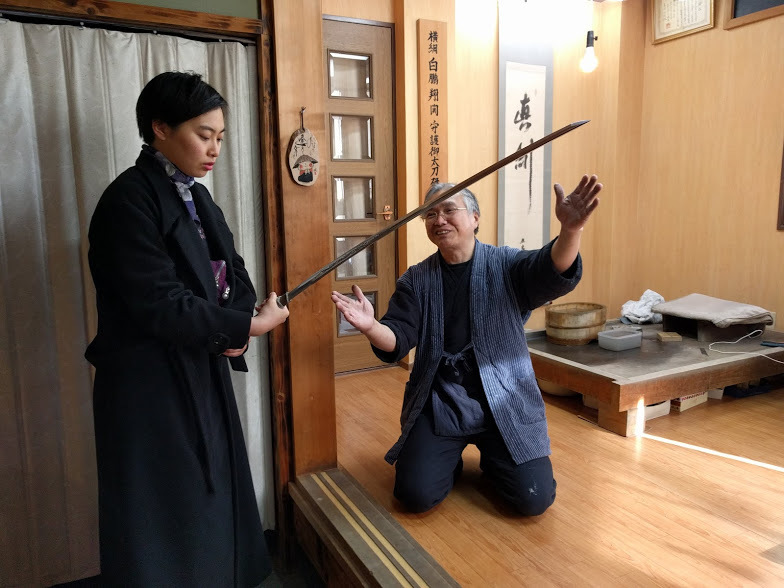 This was special tour with Miraiya shoten( Famous book store ).Tour itinerary is based on the mystery novel “Maboroshizaka”written by Mr Arisugawa Arisu.20 participant walk around 7 slopes in Shitennoji area. 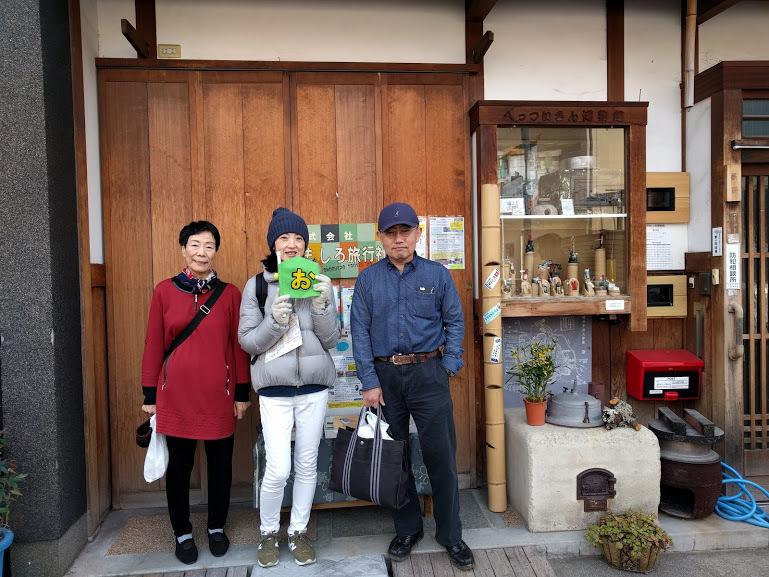 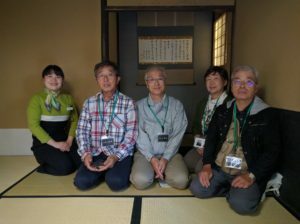 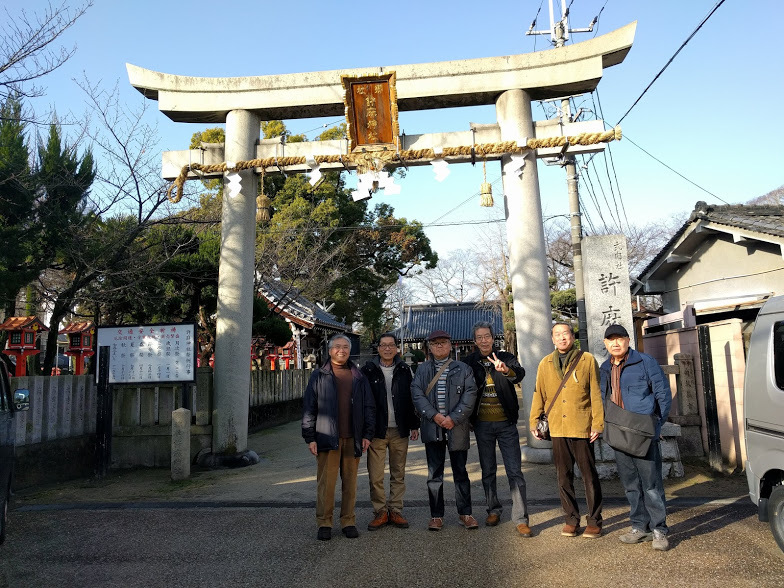 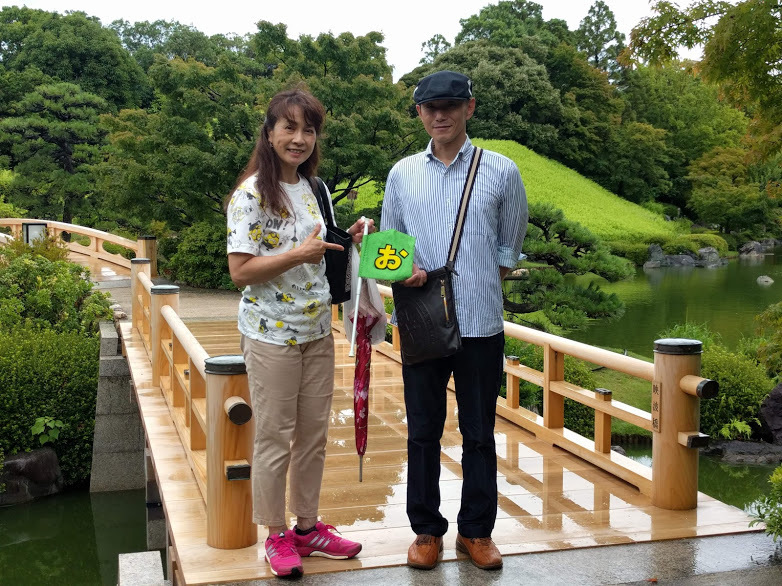 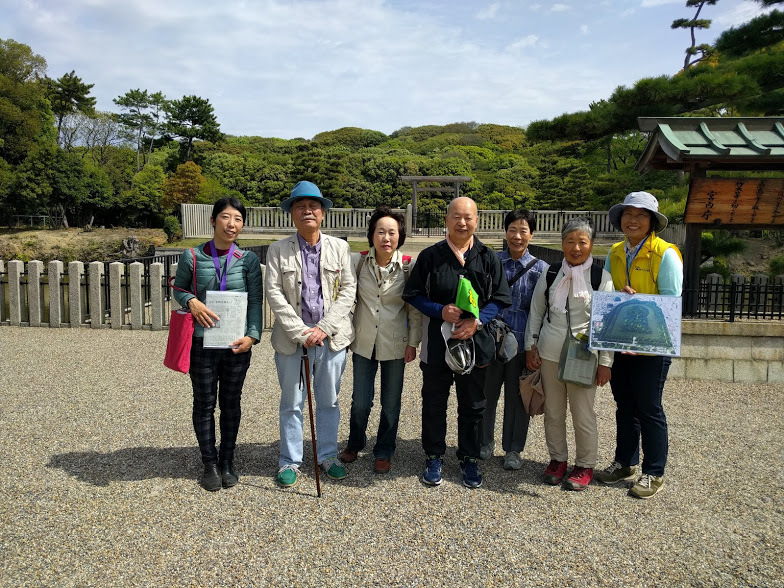 Guest from different prefecture such as Tokushima,Hyogo enjoy our Sakai tour.They met at first time in this tour however they got along together very well and had fun time. 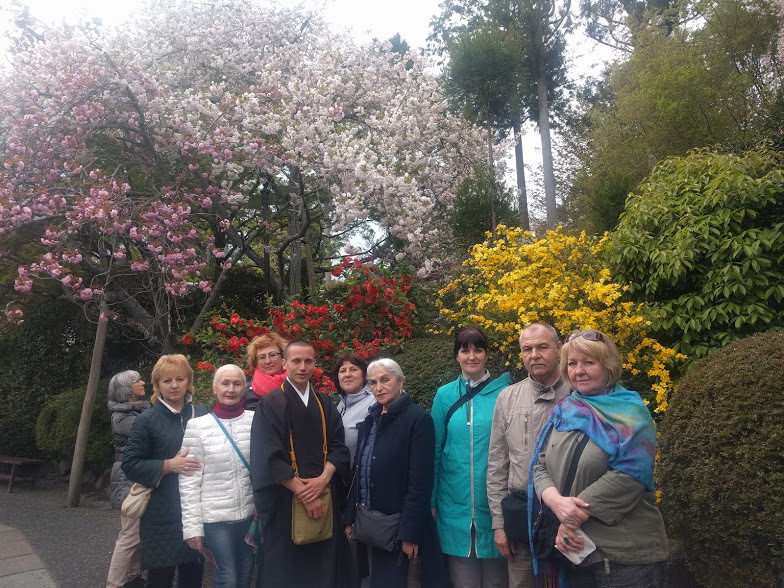 16 guests from Russia visited Ancient Capital of Japan,Kyoto!This was charter Bus Tour with guide. 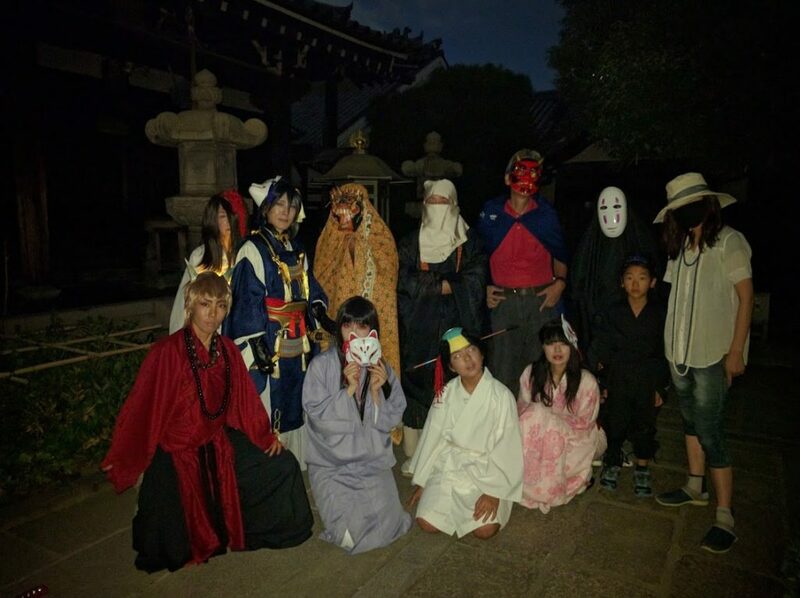 They visited the most famous spots such as Golden Pavillion,Kiyomizu temple , Gion,Arashiyama etc. 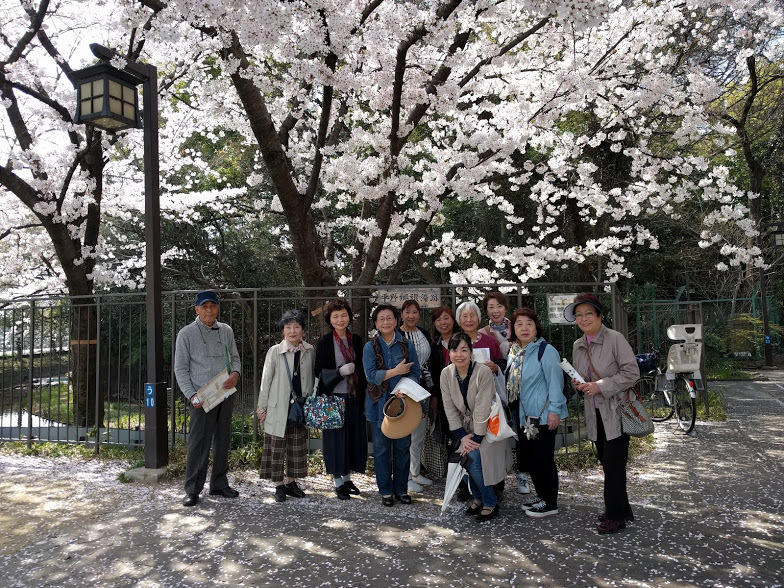 Sakura is still on season!Female chorus team consists of 10 guests enjoy Hirano old town walking with local guide. 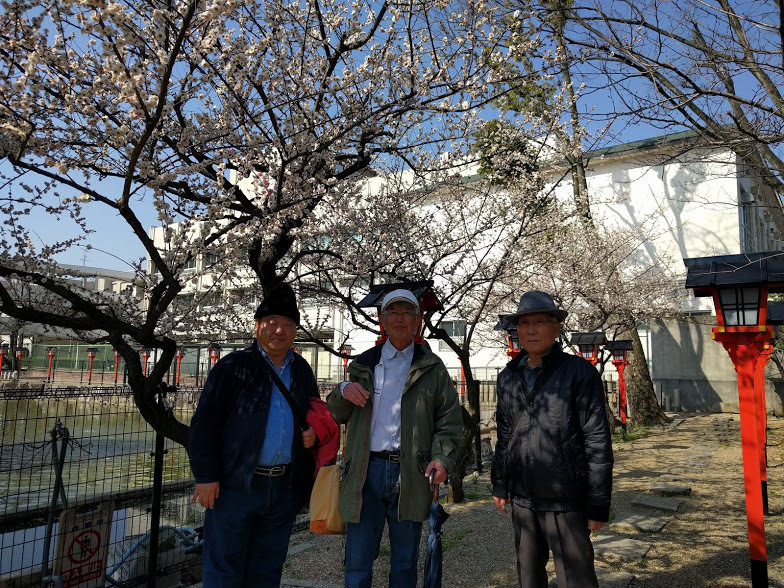 Sakura season has come! 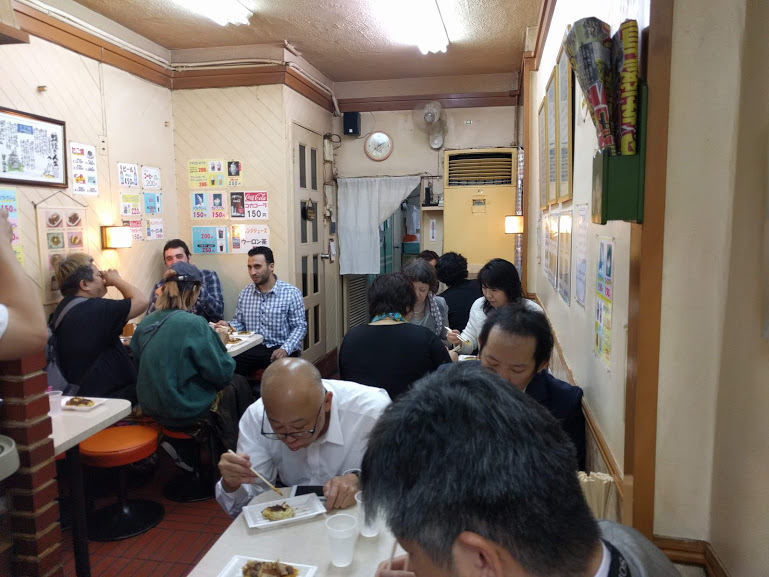 4 guests from all Japan and other 4 guests from New York(!!) 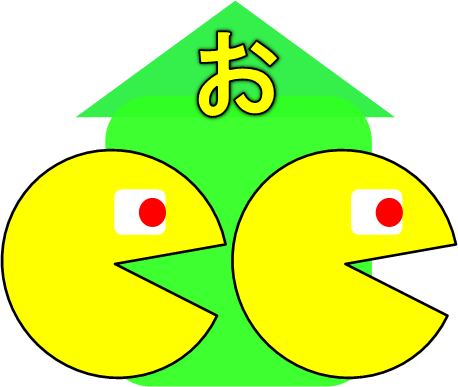 this time. 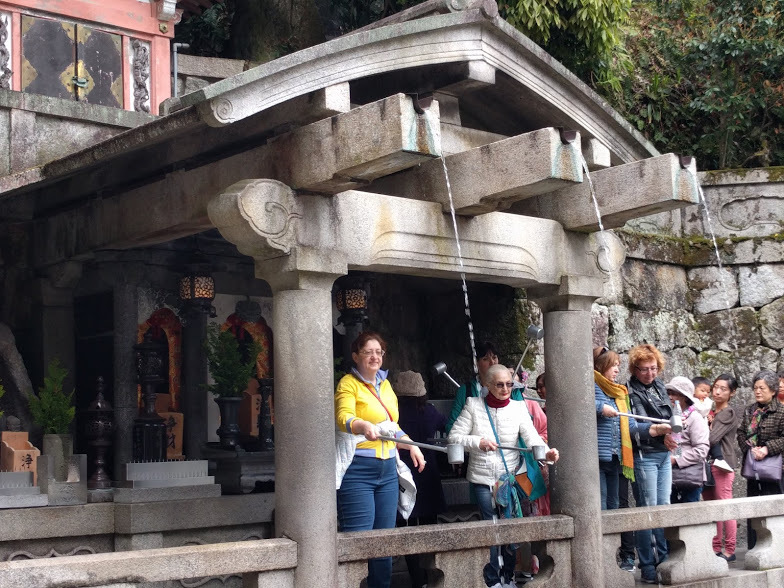 All tourists enjoyed communication each other eventhough their generation,occupation,language are all different! 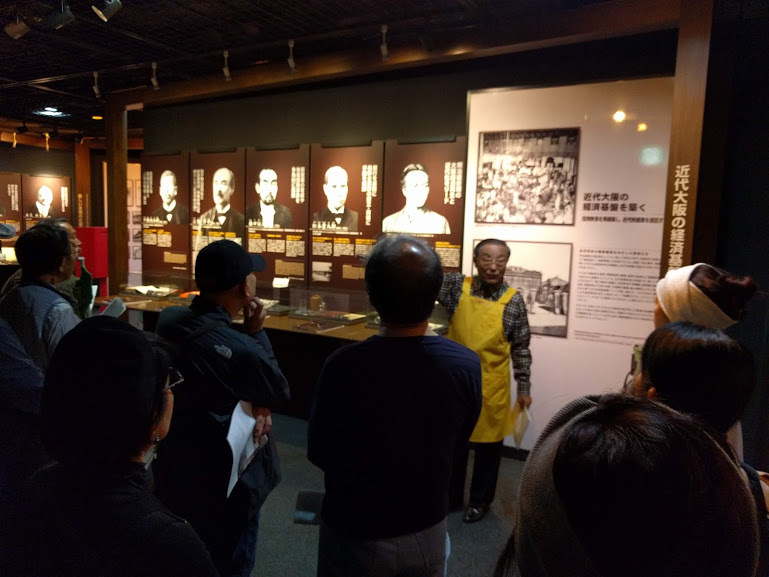 This tour was one of the collaborated event concerned with JR new station opening ceremony. 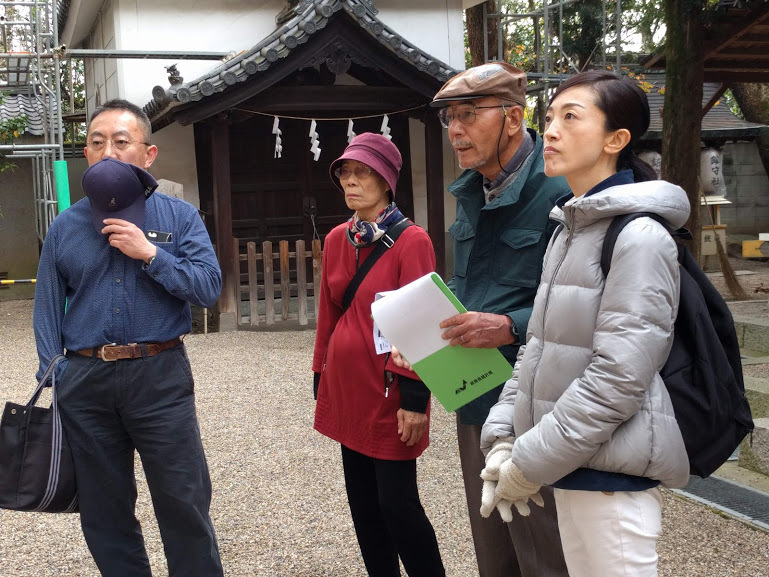 Many local guests joined our mini tour and enjoyed 4km walking with local guide. 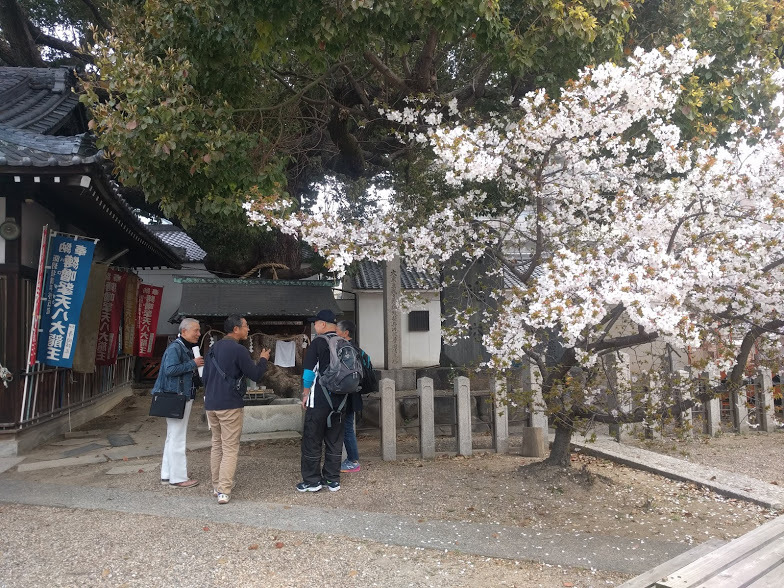 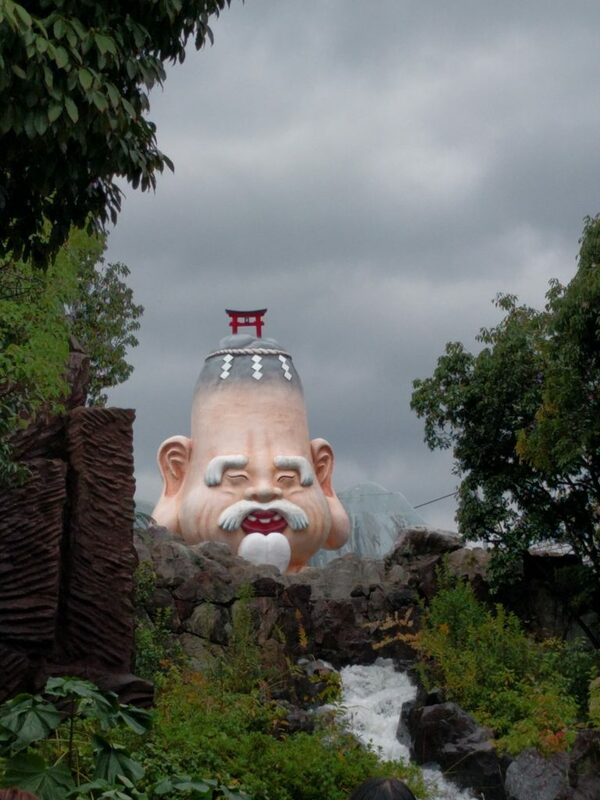 NOT tuoristic town Hirano has long history and many Omoshiro spots!Visitor from Tokyo enjoyed walking around Hirano and chat with habitants on sunny day.Here is Must Town to visit when you come to Osaka,Japan! 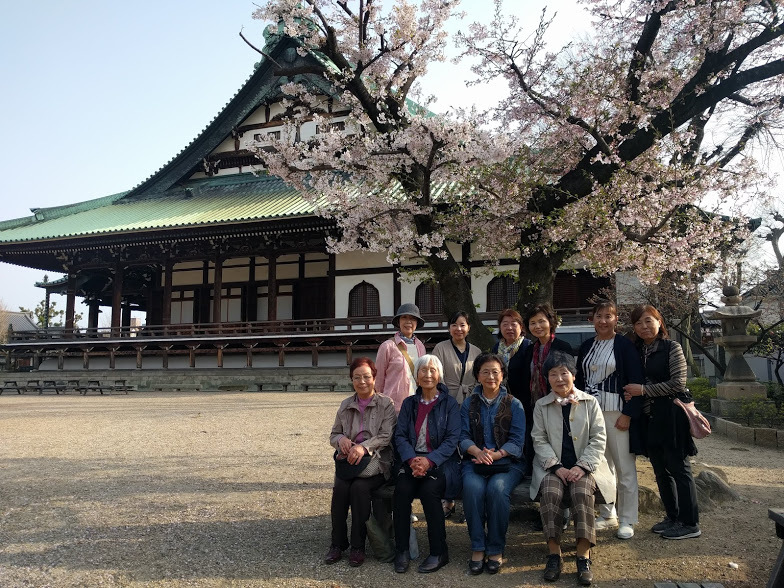 4 Female guests joined Sakai city tour. 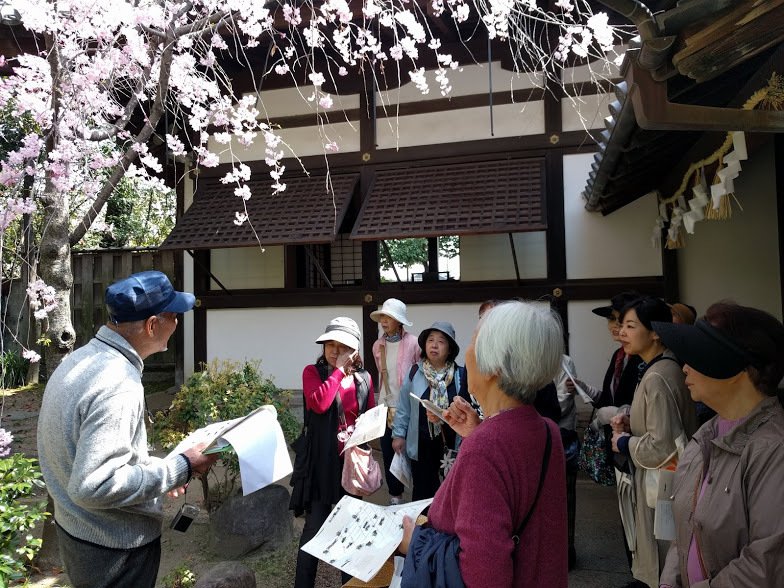 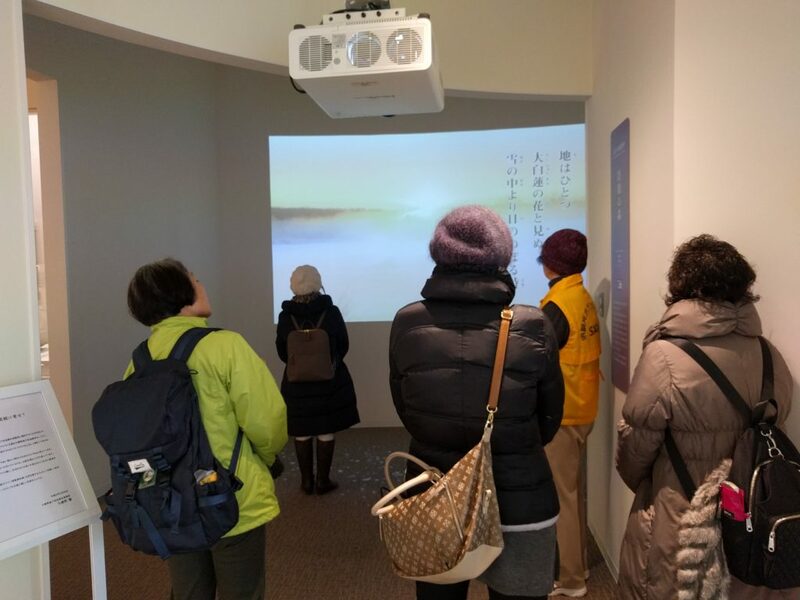 Although They are from different city and occupation,they had really good friends!They were overwhelmed Akiko Yosano’s passion( famous poet ) in museum.Pram flower was about blooming in Japanese garden. 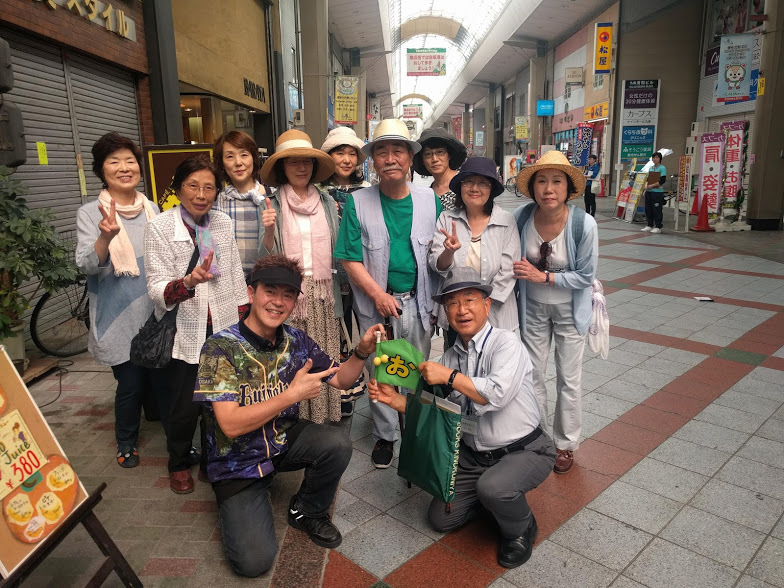 Famous TV program ” Yo-i DON!”visited Omoshiro Travel.We did mini mini tour with Mr Hachimitsu( Popular star ) & staff.It was so much fun! 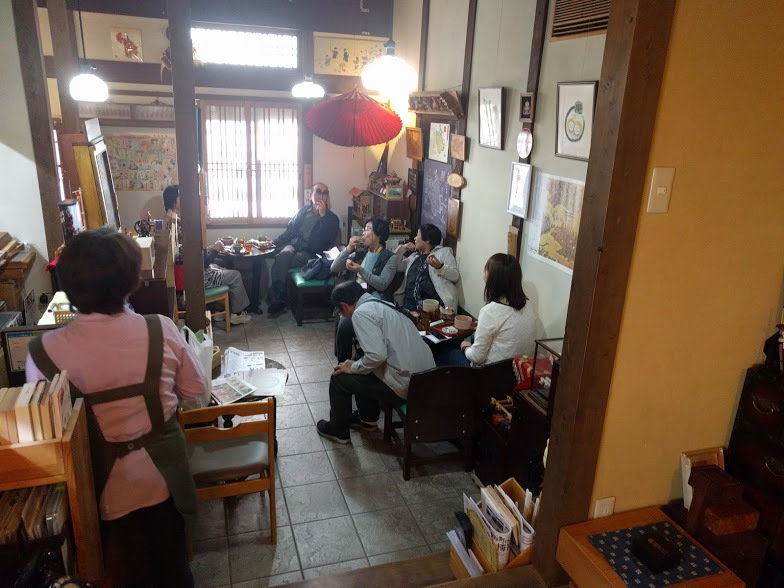 This time 6 male guests join our tour.They really enjoyed time trip experience in Yao city. 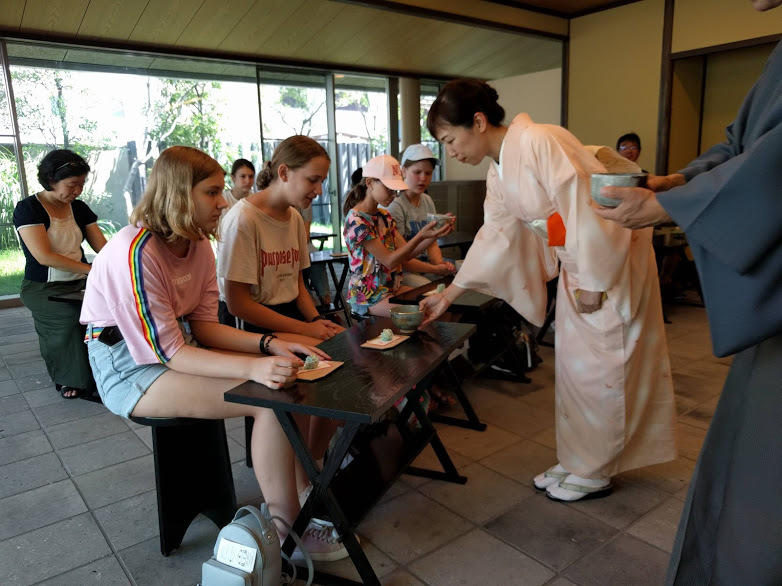 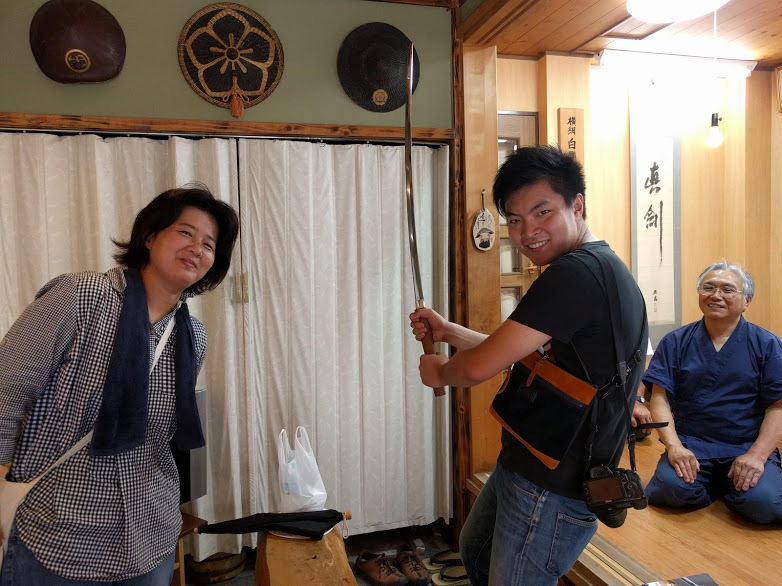 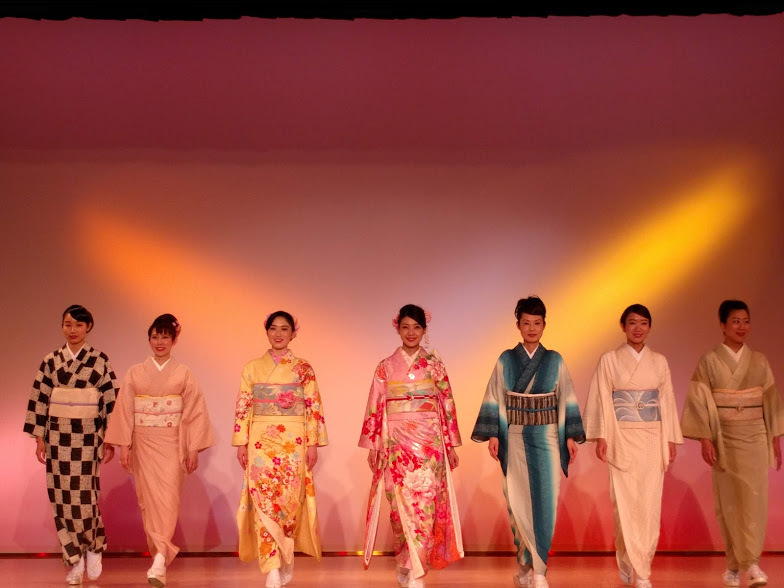 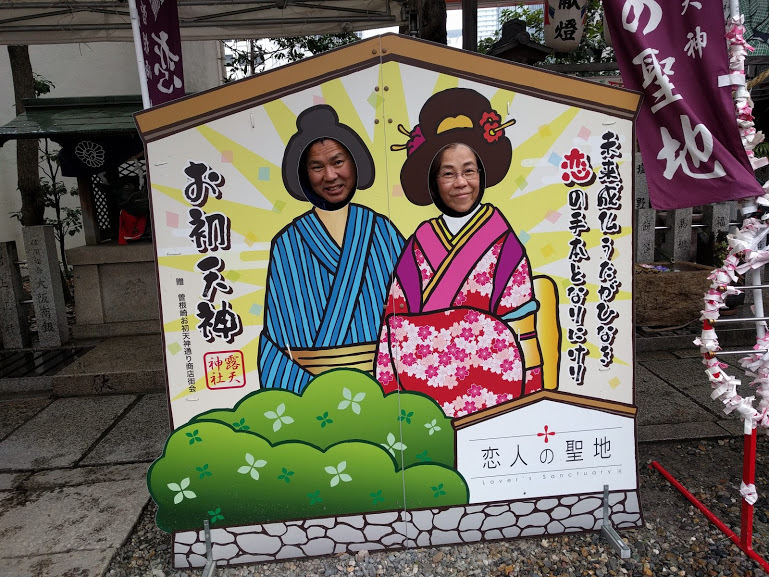 7 tourists joined this tour.They are friends from table tennis team!They enjoyed tea ceremony,dish and sightseeing.This day was “Nice couple day”in Japan,so there are many couples who are taking photos wearing Kimono at Japanese garden! 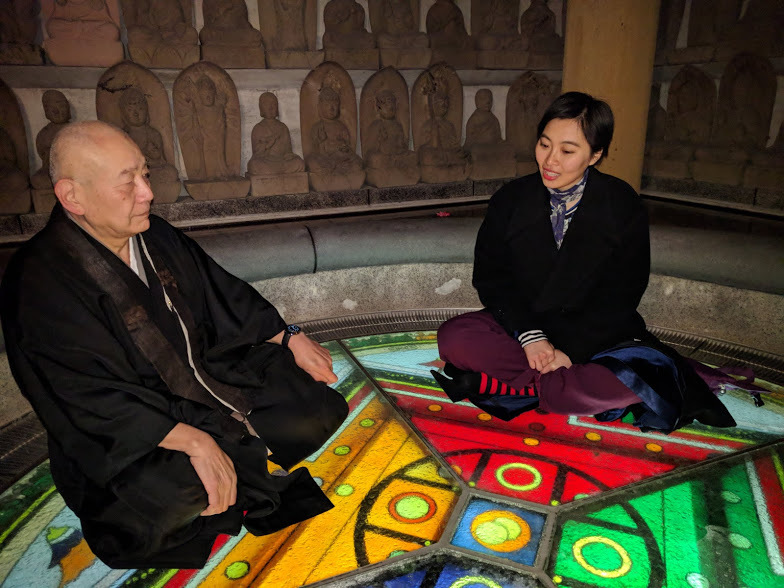 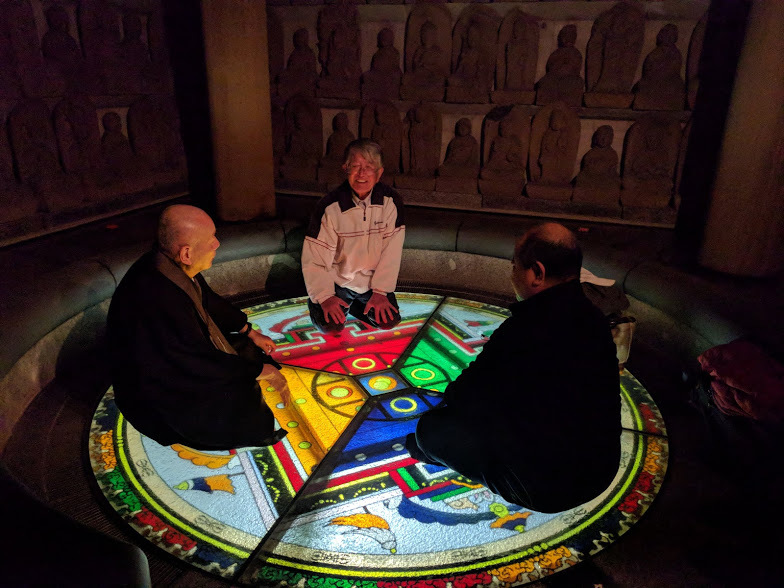 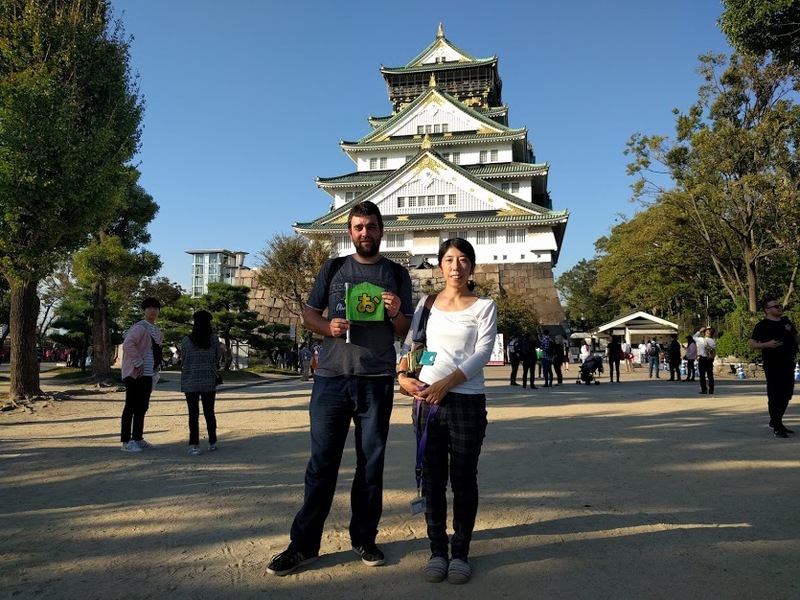 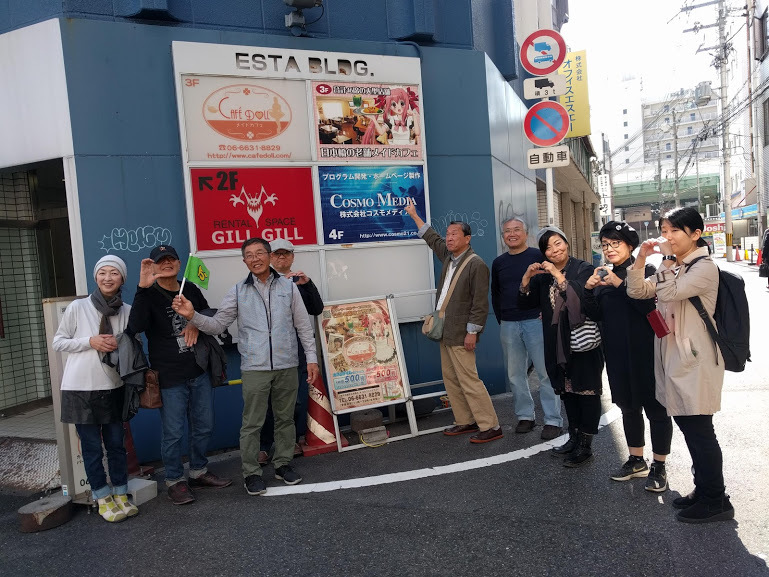 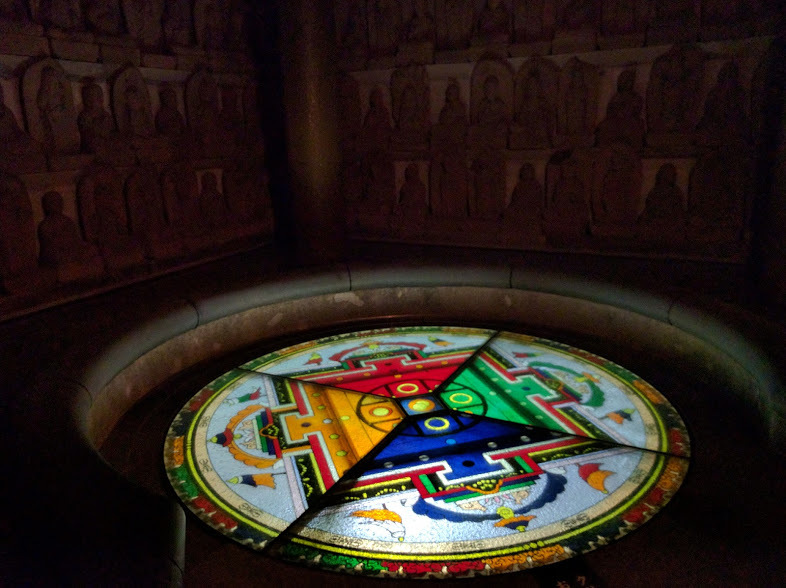 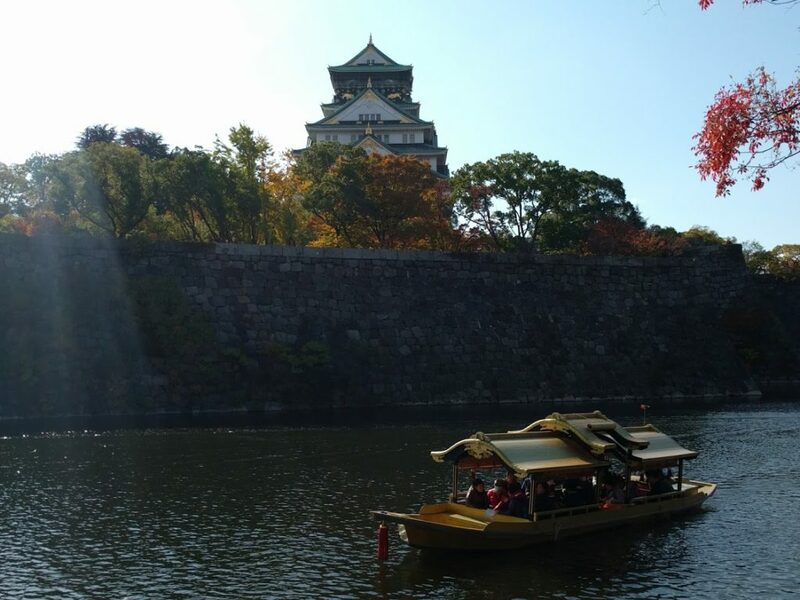 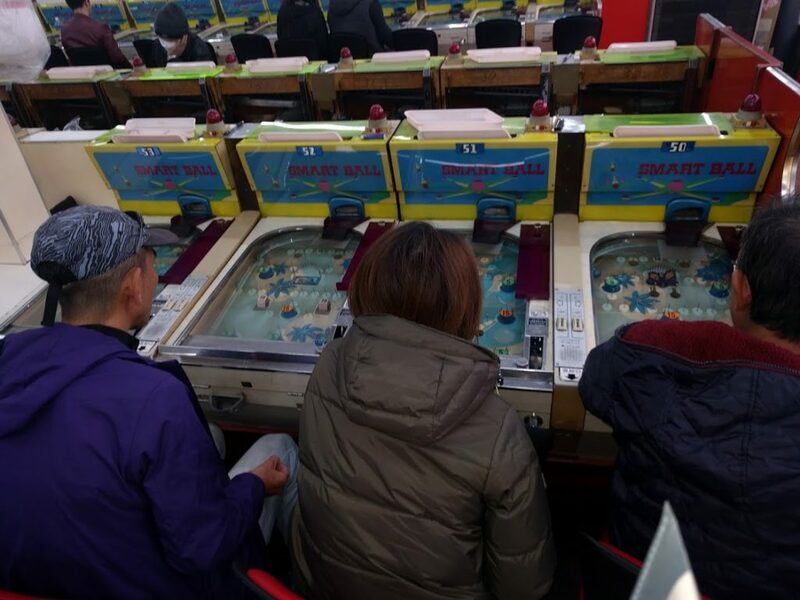 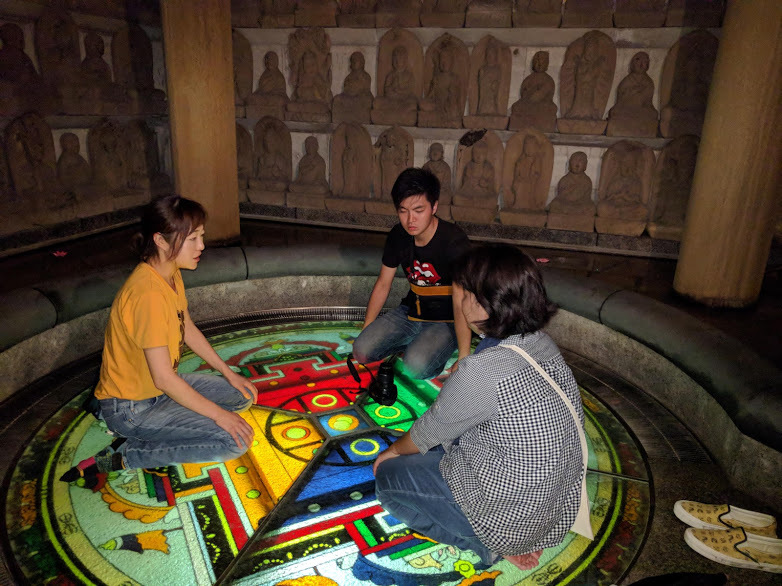 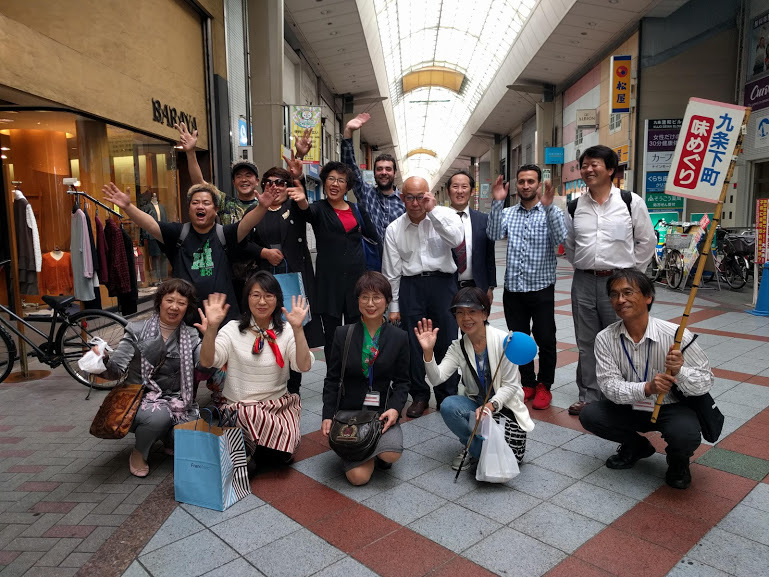 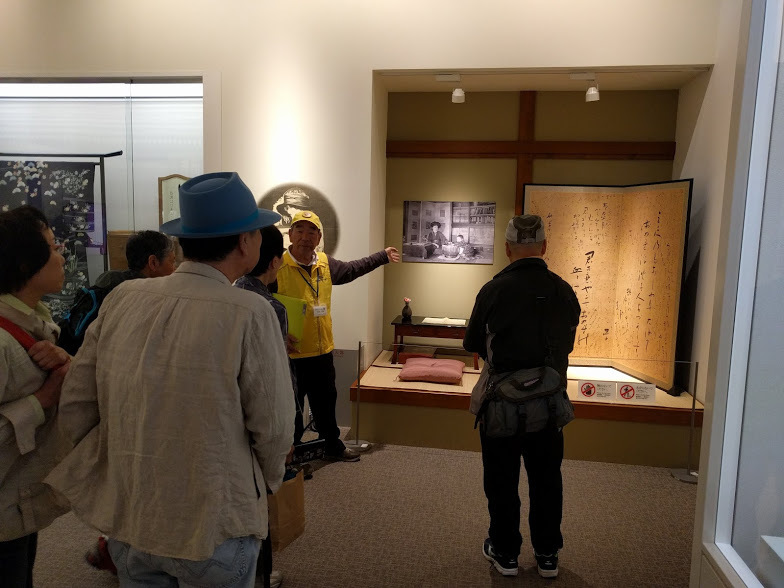 Guests who are from Tokyo and Kyoto enjoyed unique program of us-Mini cruise around Osaka castle,Play with smart ball games in Shinsekai area,Visit to ”The Entrepreneurial Museum of Challenge and Innovation” and Hot spring so on! 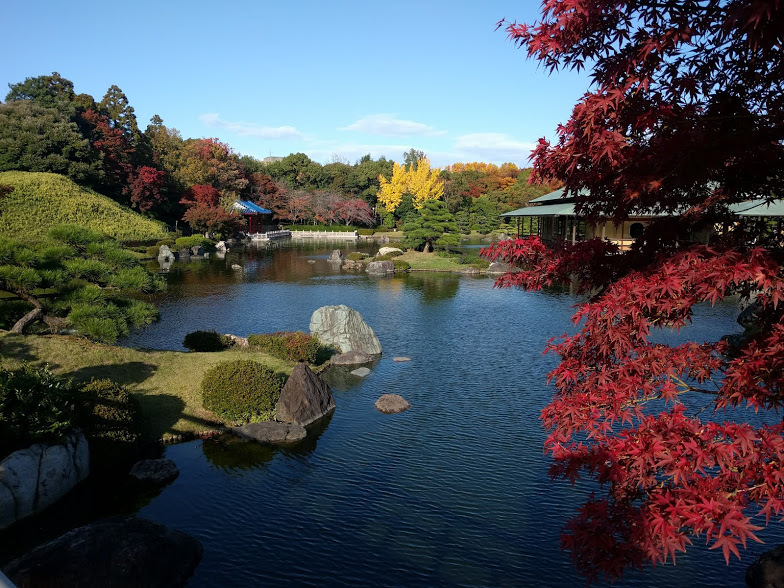 Guests enjoyed beautiful Japanese garden in sunny Autumn! 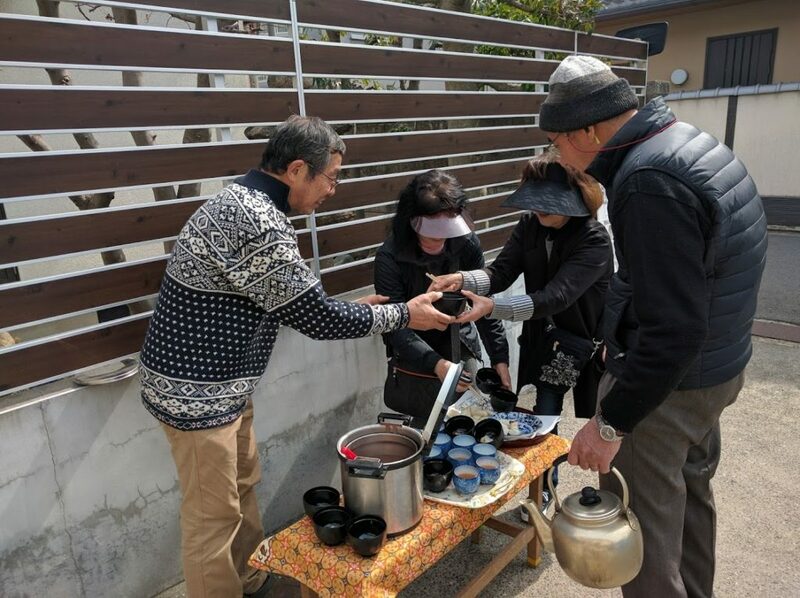 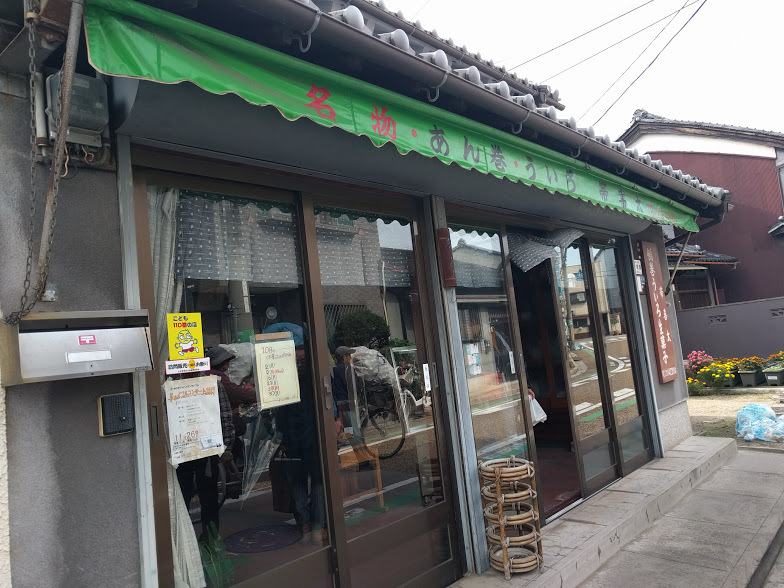 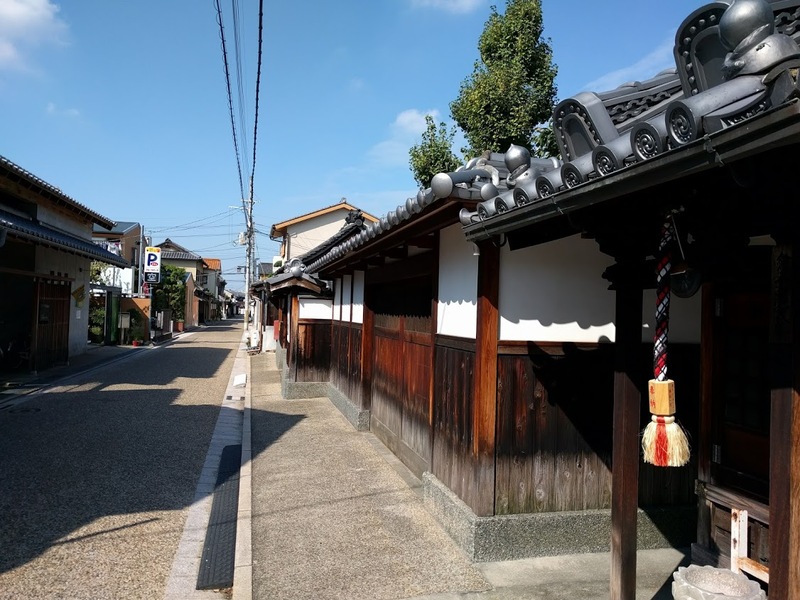 NOT tuoristic town Hirano has long history and many Omoshiro spots!Visitors enjoyed walking around Hirano and chat with habitants on sunny day. 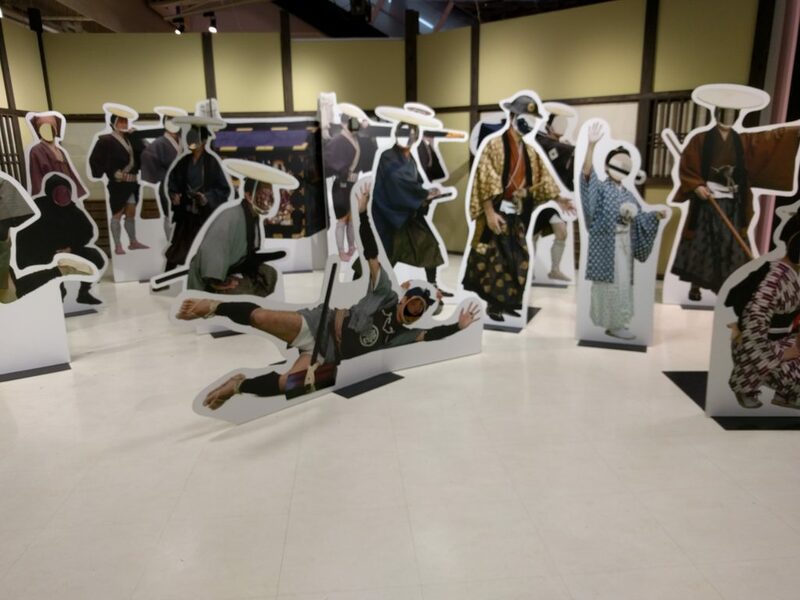 Toei Kyoto Studio park where you can see film set or try may kind of attractions were visited many tourists last weekend. 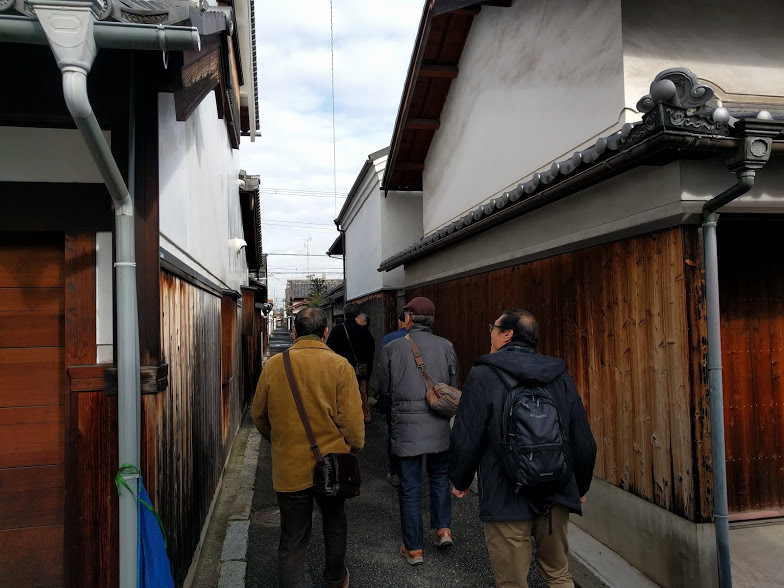 Walking in sunny old town in Yao city.Guests surprised to find out such old part from Edo period(3-400 years ago) are still left. 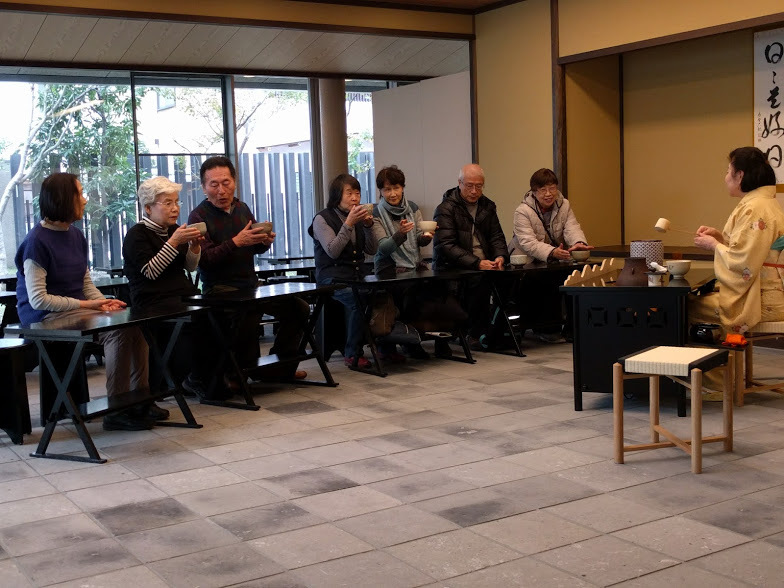 All guests enjoyed Japanese garden,tea ceremony,Rikyu(Tea master )&Akiko(Poet) museum in sunny Sakai. 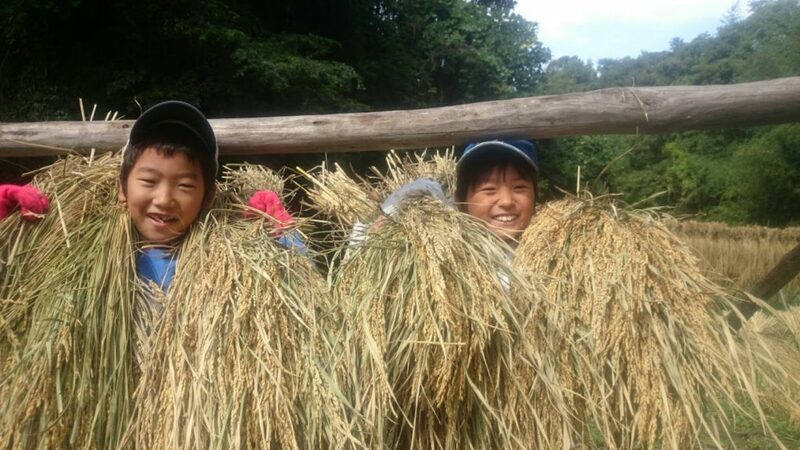 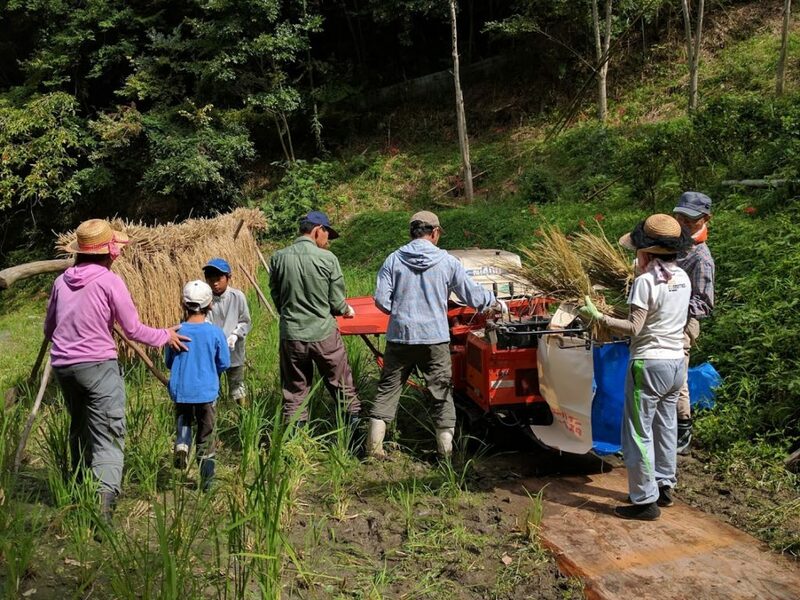 All age enjoyed threshing experience in the farm. 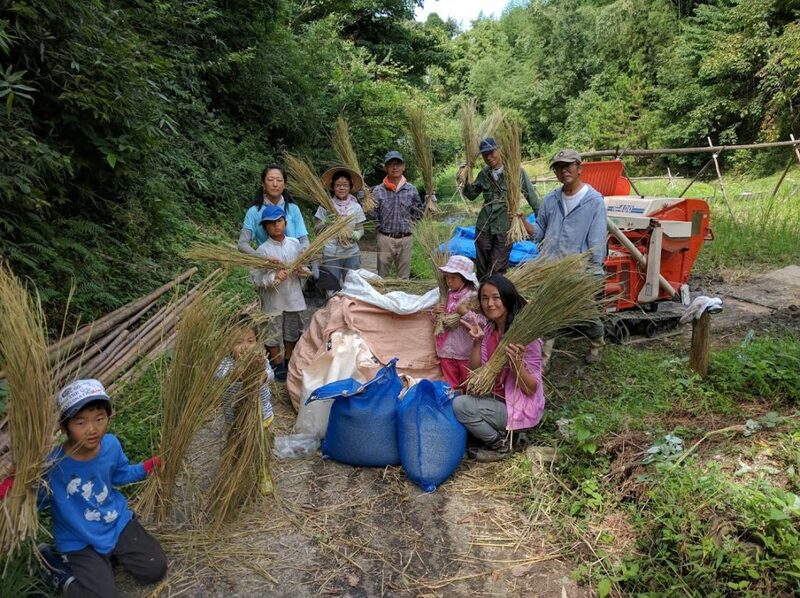 Can’t wait to eat fresh rice! 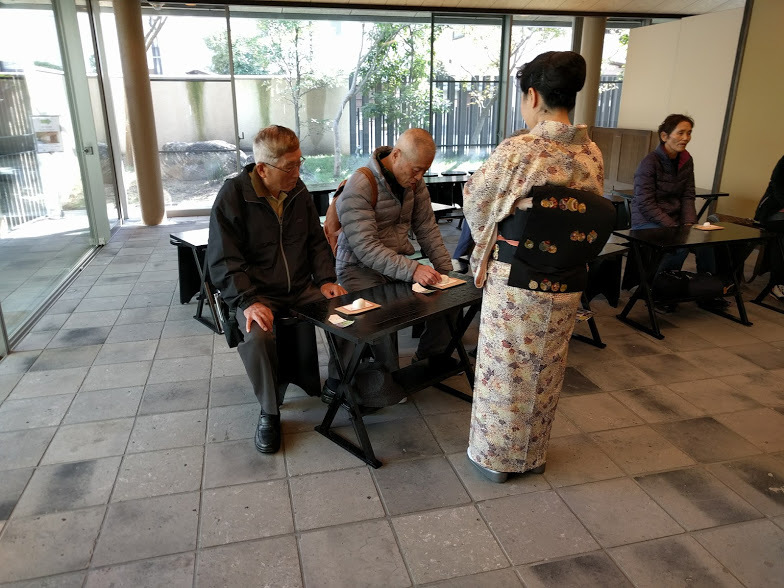 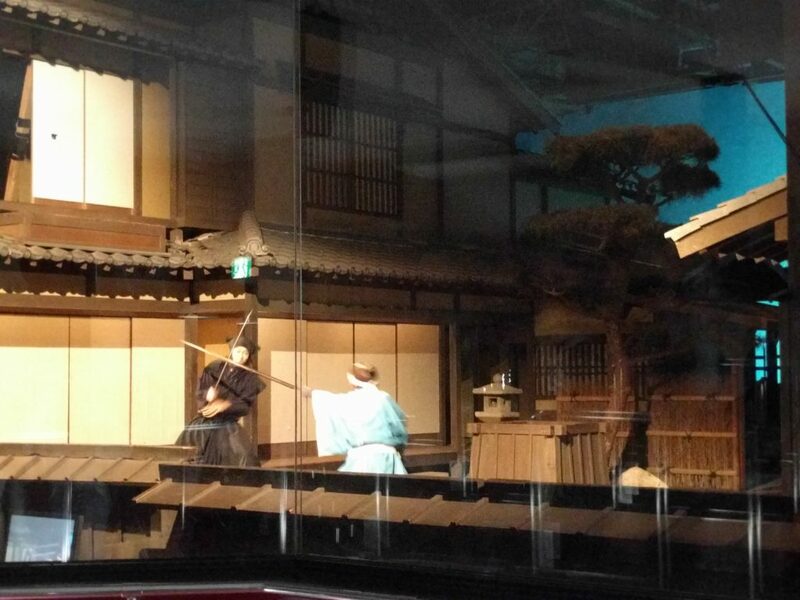 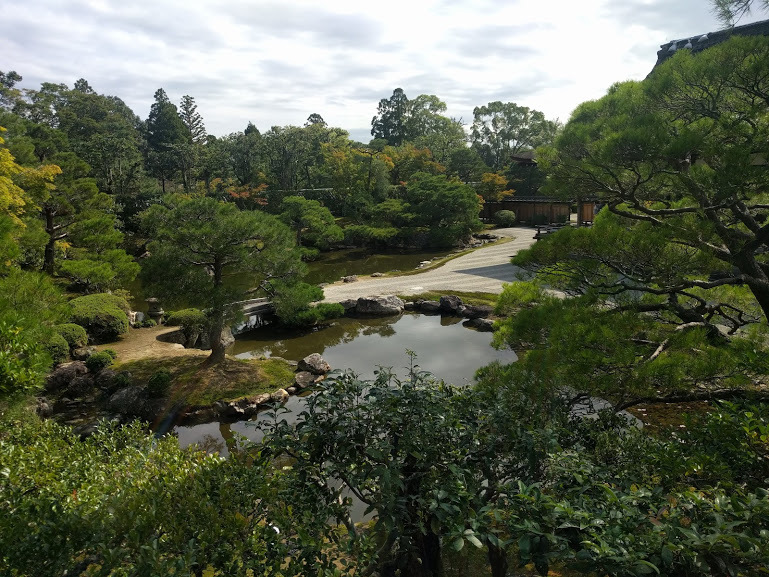 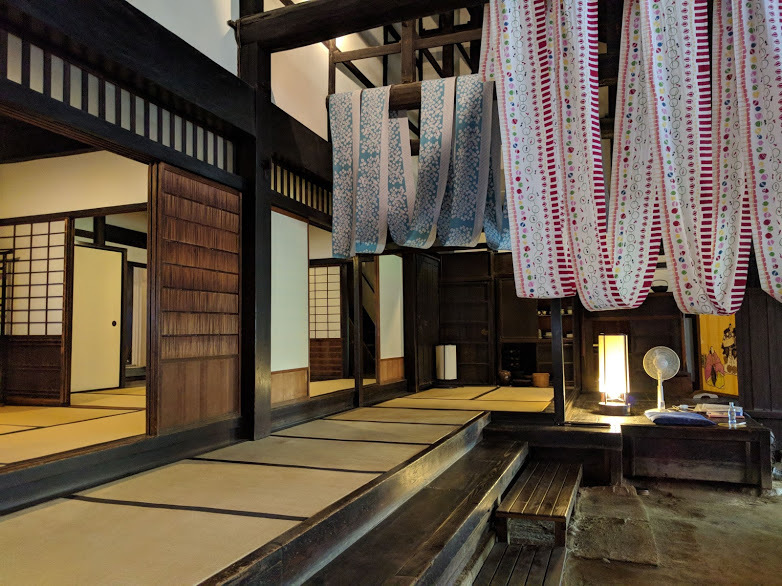 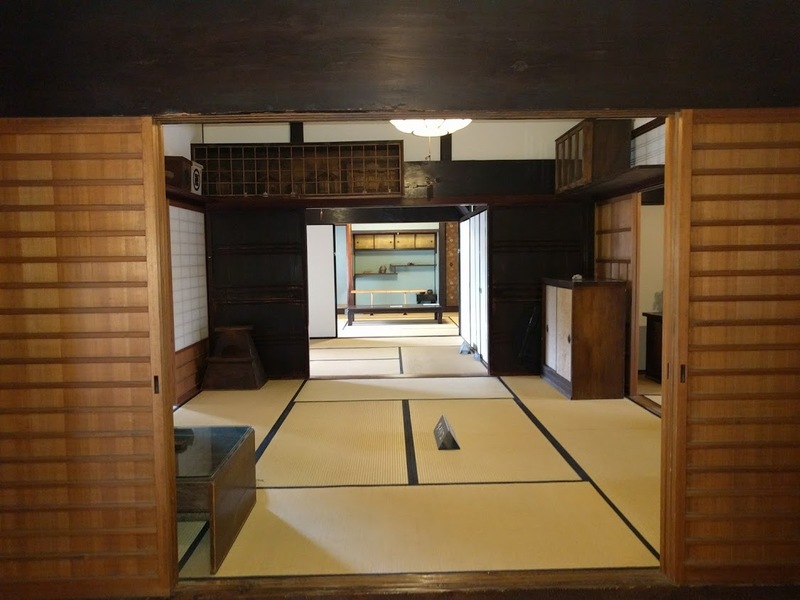 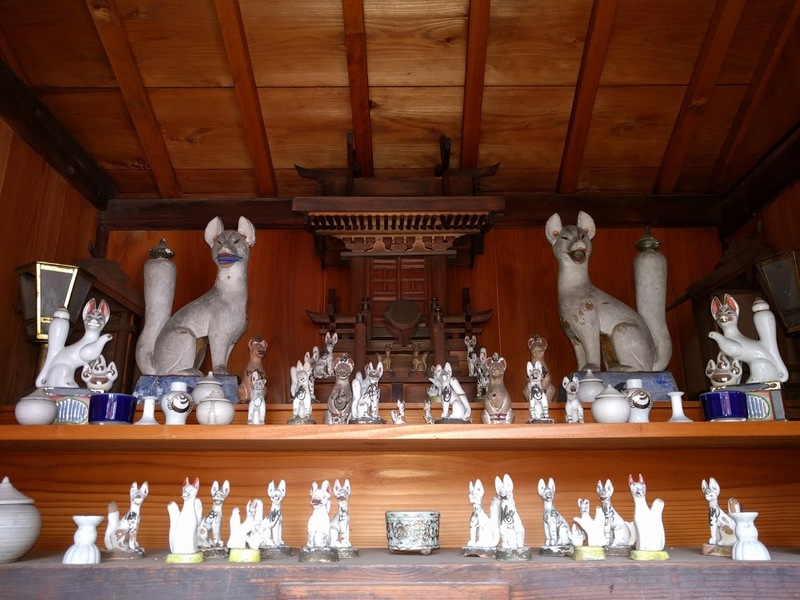 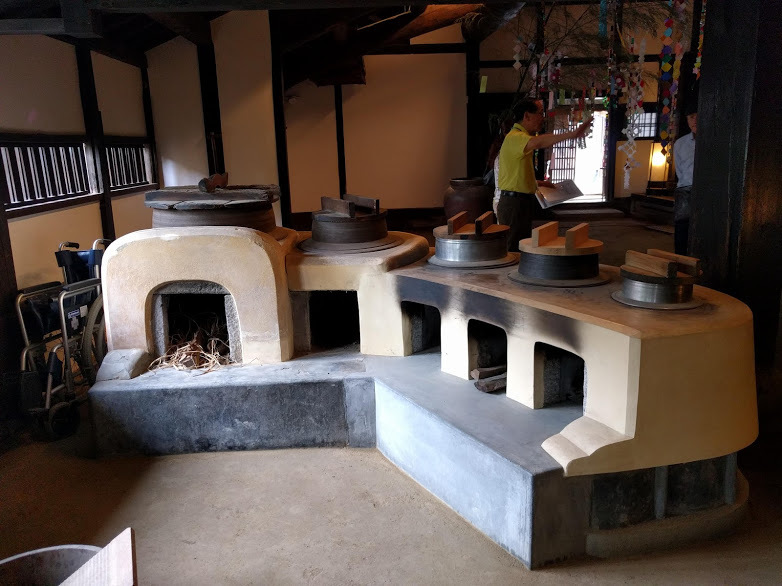 Sakai is the neighbor city of Osaka(appx 20km) which has historical and cultural charm.Well known 2 cultured persons Akiko Yosano(poet) and Rikyu Senno(tea master)are from Sakai.The New museum for them has just opened in 2015! 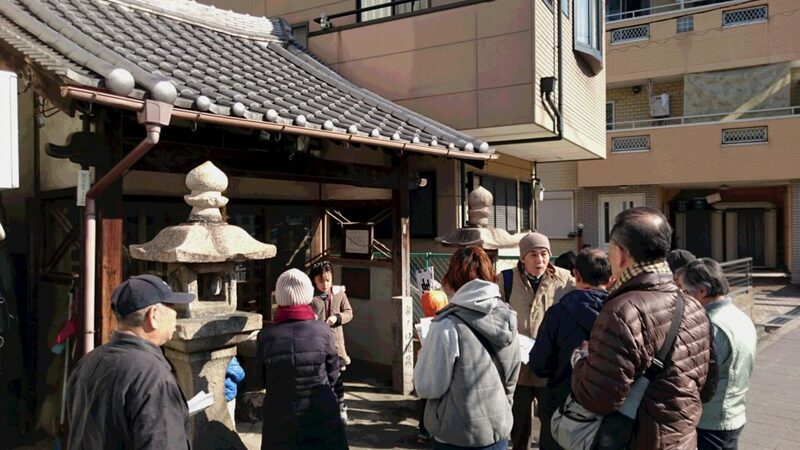 The city is now attempting to have some tumulus(Nintoku-ryo etc), listed on the World Heritage registry. 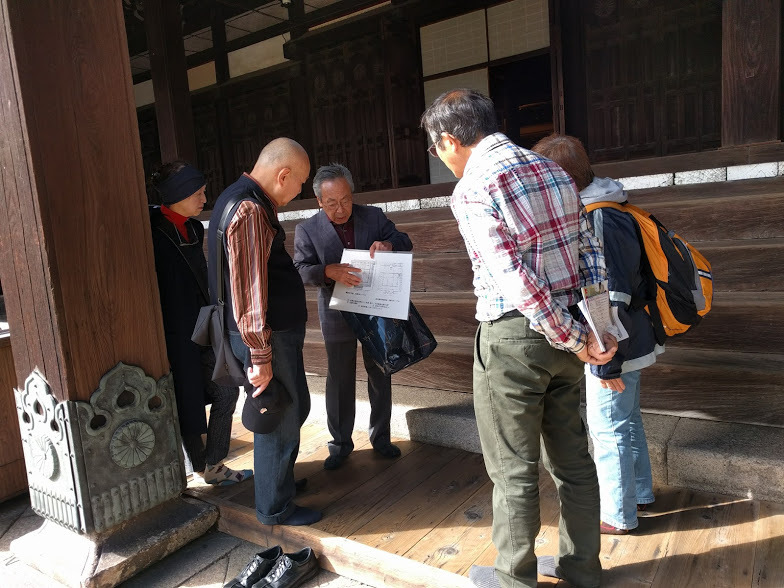 Thousands of tourist will pay more attention to Sakai if they will be registered in 2019. 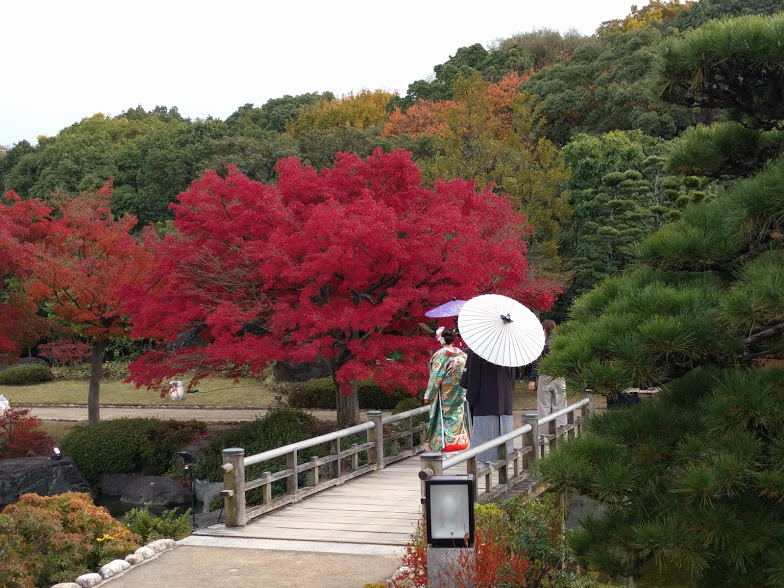 Now is the CHANCE to visit Sakai ! 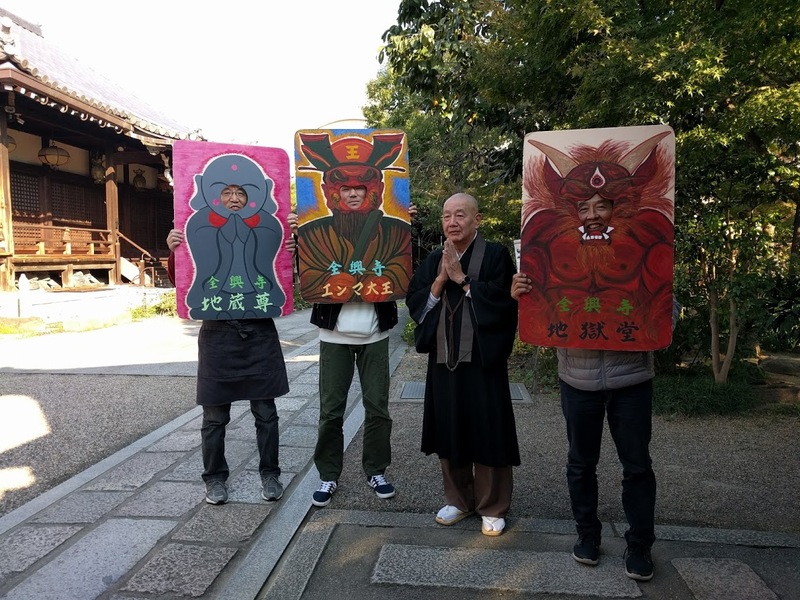 Costumed local inhabitants gathered to temple and each talked real scary story of him/herself. 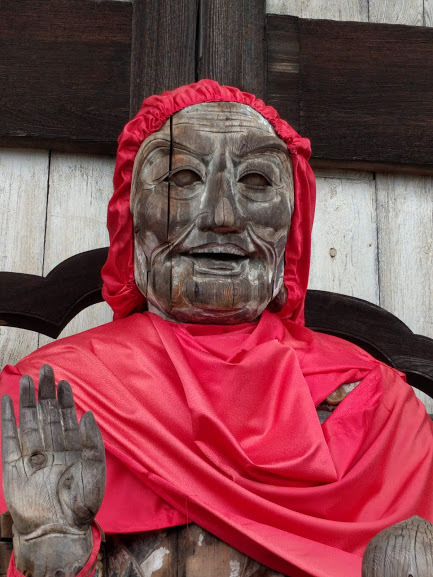 There are 13 major Patron saint( we call it ” OJIZO-SAN”) in Hirano-ward. 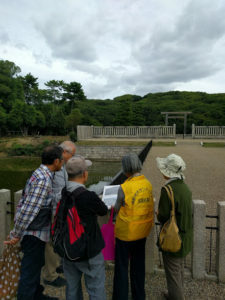 Local guide led small group to mini walking tour.